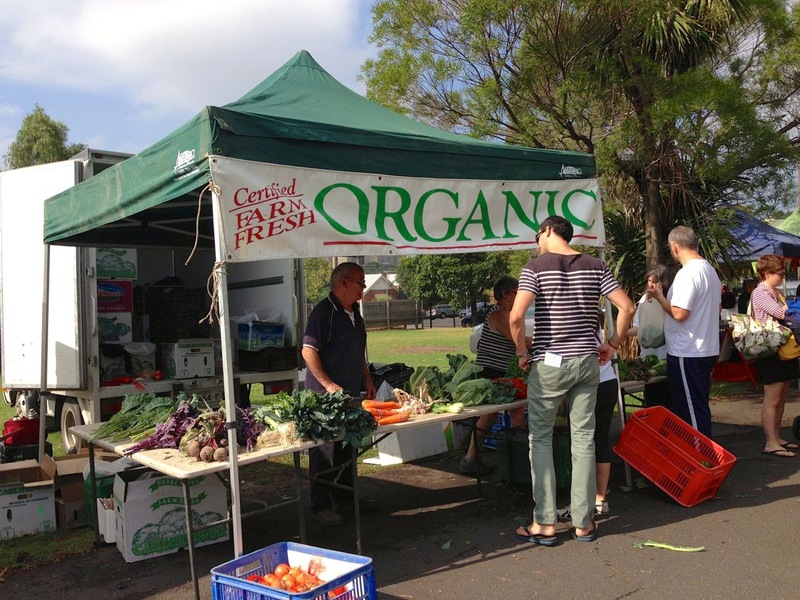 Until a local farmers market open last year, I visited many farmers markets in Melbourne. Then we had our own and I haven't ventured far afield since then. 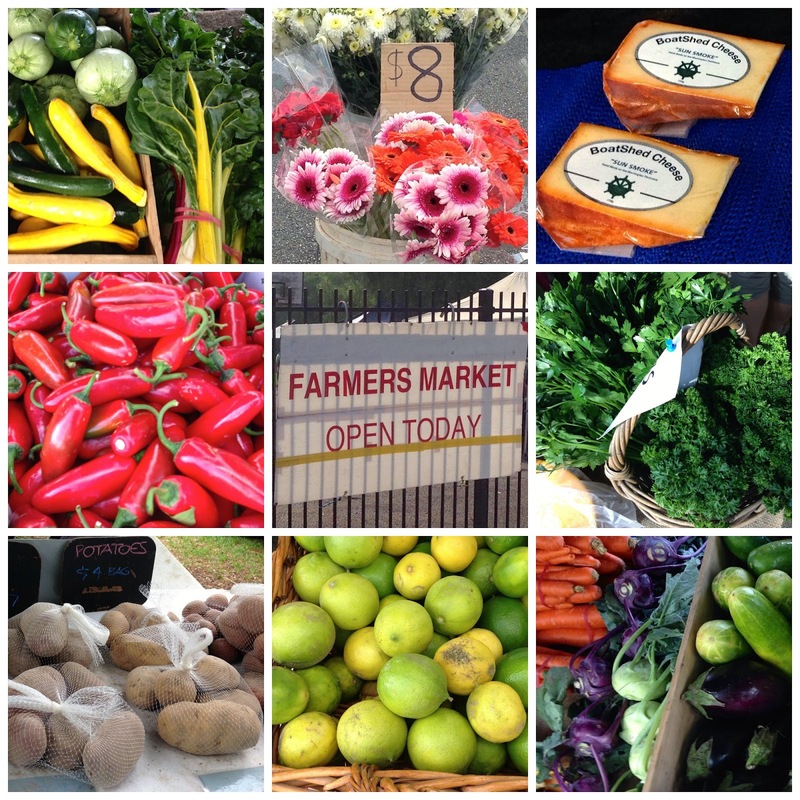 This weekend I had a yen to go to a farmers market. 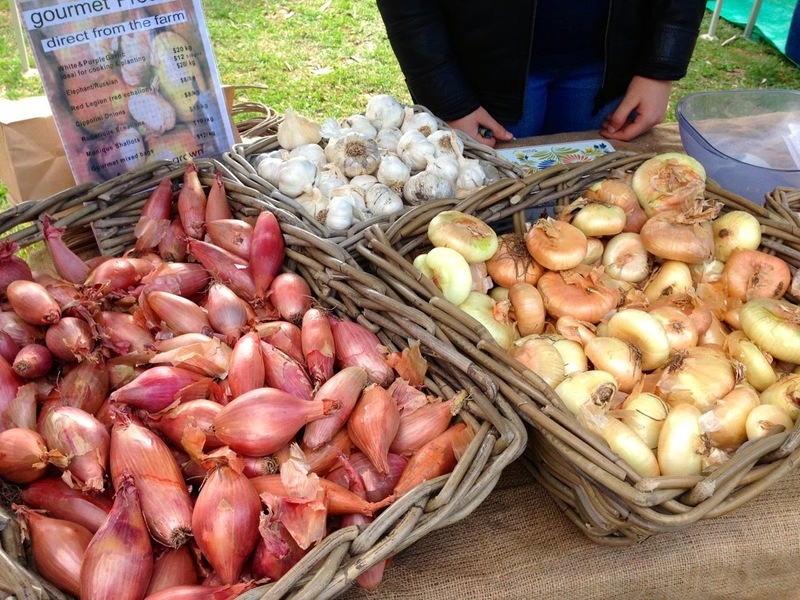 The fifth weekend doesn't offer many farmers markets. 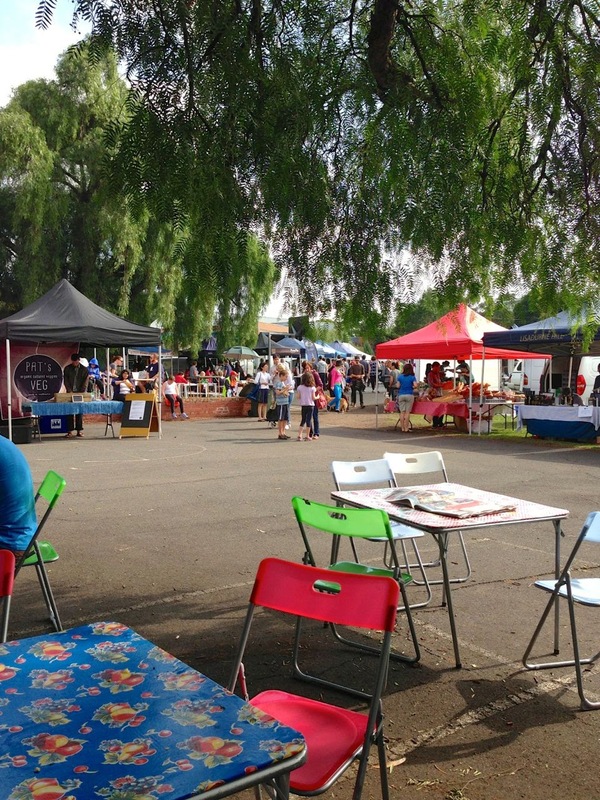 Thank goodness that Flemington Farmers Market is on every Sunday. I really enjoyed our visit there and am sure I will return some time. Our first stop was at the Red Beard Bakery from Trentham. 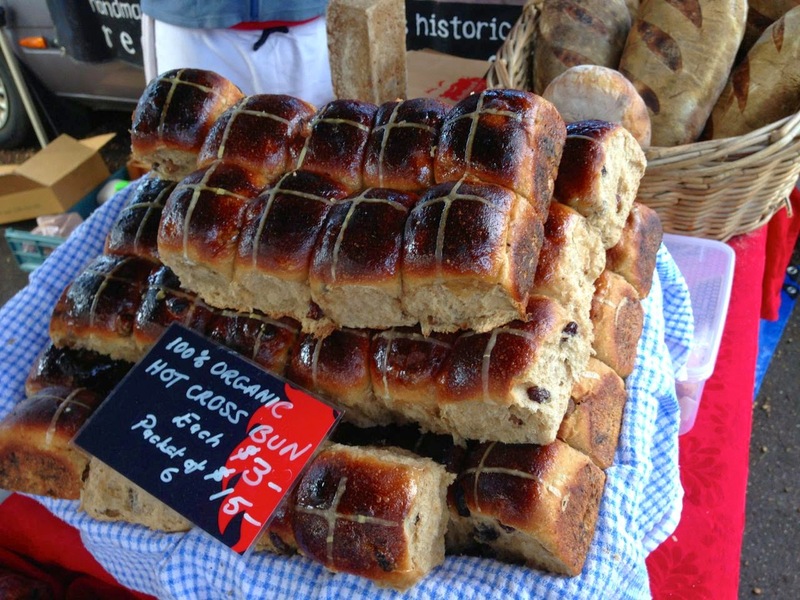 We tasted their sourdough hot cross buns and immediately bought a six pack. They were light and fluffy but substantial too. I looked longingly at the loaves of bread but I have a sourdough starter begging for attention. Then I dragged Sylvia away from the bread tasting. Before any more purchases, we walked around the market to get a sense of what was there. 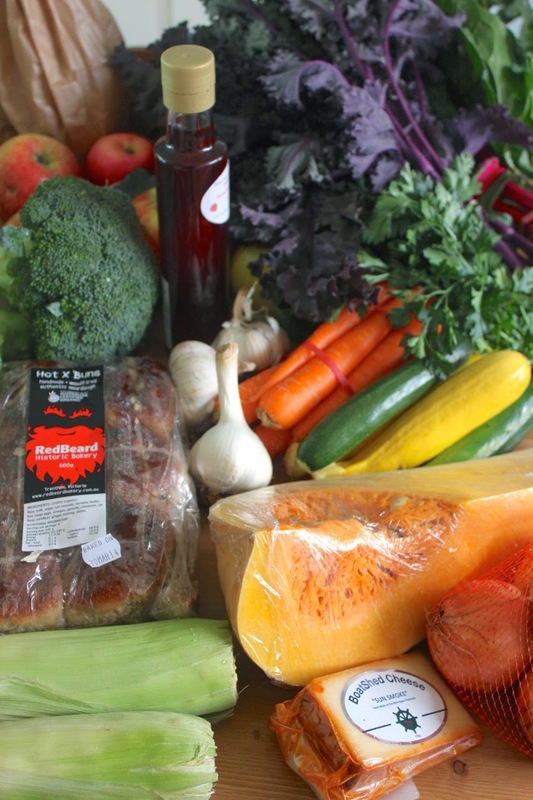 It is always overwhelming to see the array of goodies on offer at a farmers market and it was hard to know where to start. We walked by the cat treats, the oversized zucchini and the fundraising honey joys. We began with a snack. Not one of these pies. Firstly we shared a soft chewy salted pretzel. 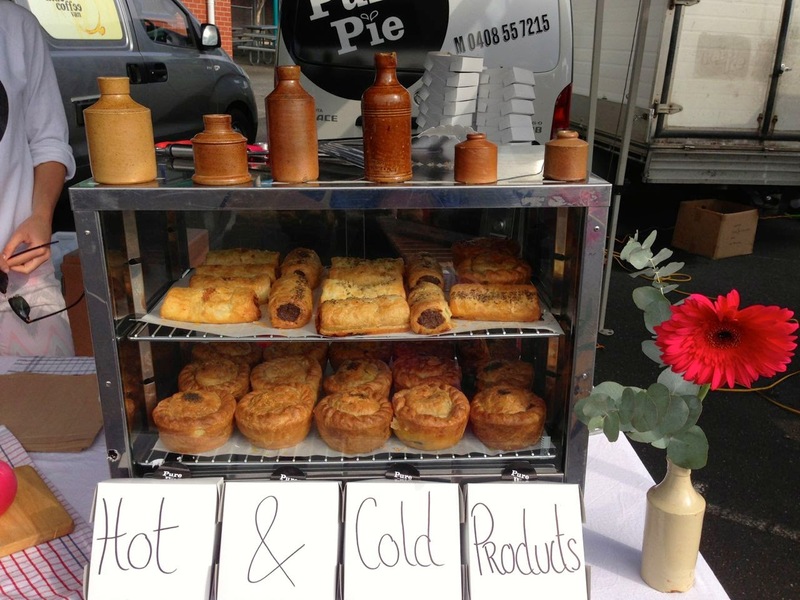 I looked at the Pure Pie stall longingly but they did not seem to have any vegetarian ones that were warm. It was too early for pies. Instead Sylvia and I shared a Salted Caramel Chocolate Tart. They were rich and gooey. So gooey that I rushed back for some serviettes. But very delicious. Then I bought some garlic. Because we needed it. And I liked the sound of elephant garlic. We wandered around and bought vegies from a few stalls. Two coloured corn, green and yellow zucchini, rainbow chard, purple kale, broccoli, onions. 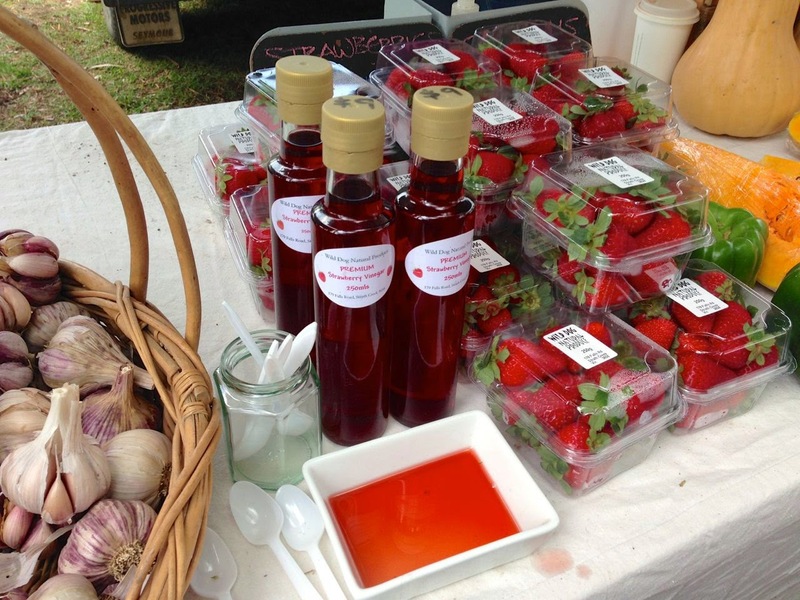 I was particularly taken by this eclectic stall with the Wild Dog Natural Produce's Strawberry Vinegar. Sylvia would have stayed and drunk all the tester vinegar. Instead I bought a bottle ($9 for 250ml) which we took home to drink like cordial with soda water. It is so so so delicious. It was only through a little self control that we didn't drink the whole bottle today. Next we headed over to the apple stall and tasted the three on offer from the Otways. I really wanted to like the Cox Pippins because I love the name but the Jonagold were crisper. Sylvia loved the red ones (I think they might have been Akane) so we bought a few of these too. Don't the apples look just beautiful. I turned some of them into a crumble tonight. On the way out I started wondering about lunch. We stopped at the pie man by the entrance and bought a wagyu sausage roll for E, a morroccan sweet potato pasty for me and a frangipani berry tart for E. Sylvia got another pretzel. My pastry had beautiful flaky pastry but was quite spicy. Here is most of the food I bought. One of the reasons I went to the farmers market was that I had made an effort to use up (almost) all the vegetables in the fridge. I was delighted that I managed to get all the vegetables into the fridge. I feel well stocked yet again and ready to face the week. So it has been a busy week. 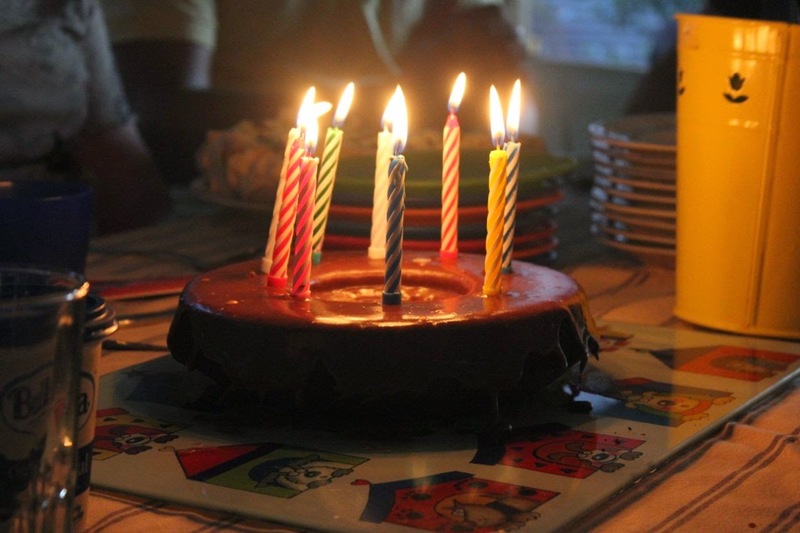 Two birthday celebrations, a sleepover and a concert. Not to mention meetings, bank queues and getting caught in the rain. And there was nut roast. While not the simplest of dishes, it is one of my easiest. 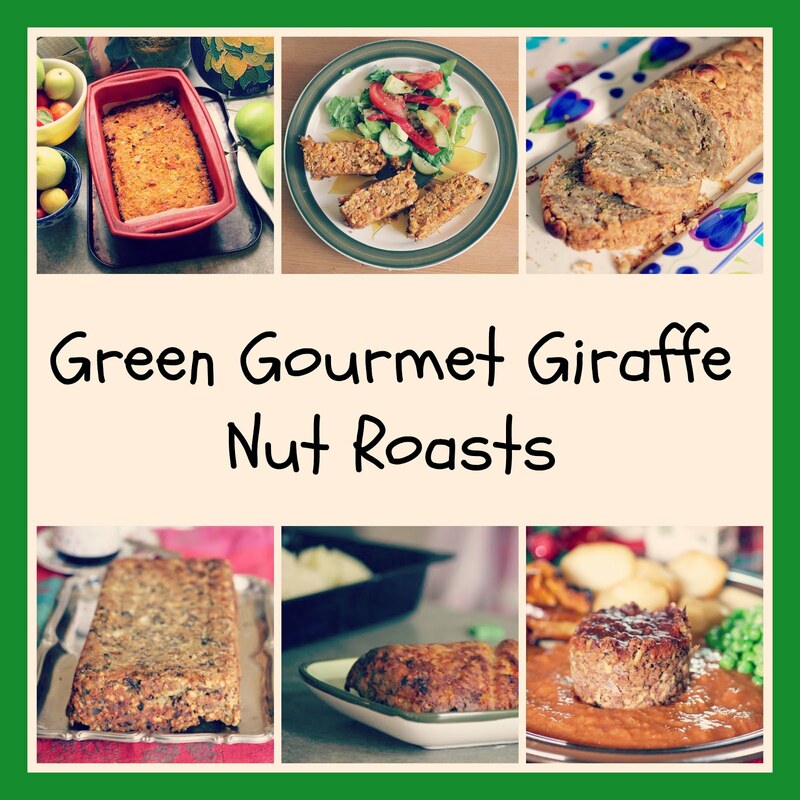 I make nut roasts so regularly that it is no effort at all to whip one up. But firstly let's start with the weekend. 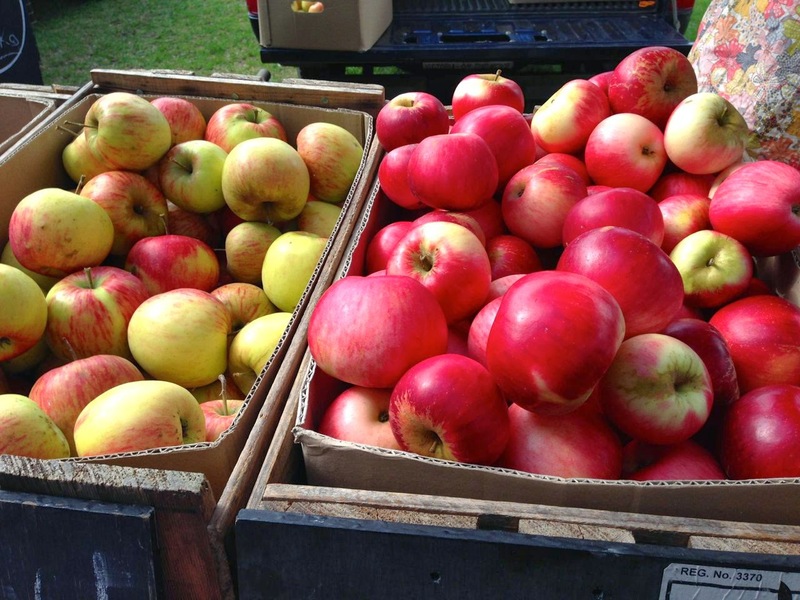 On Saturday I went to Coburg Farmers Market for the first apples of the season. 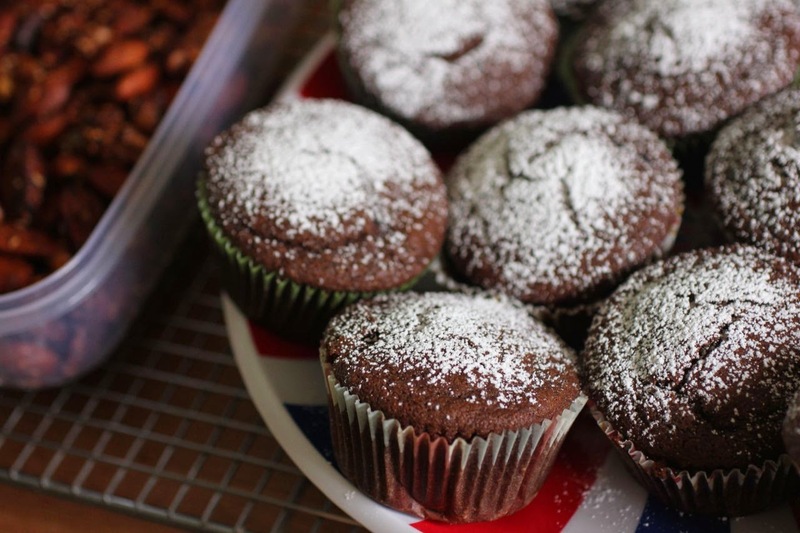 I made smoky nuts and a batch of chocolate muffins from Ricki Heller's Naturally Sweet and Gluten Free. They were for a Moody Noodles birthday celebration. The nuts were a bit burnt and the cupcakes slightly crumbly but it was great to catch up with familiar faces (and some new ones too). 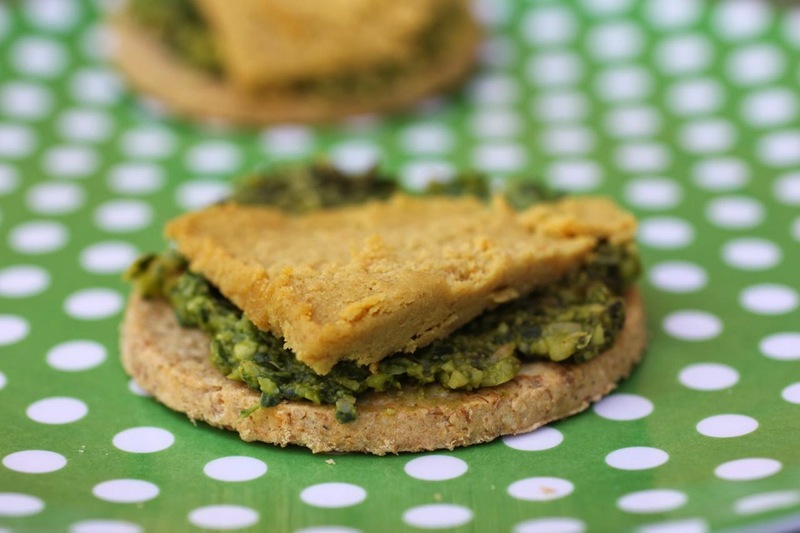 I loved K's cashew cheese with roasted garlic and smoked paprika from Veganissimo. (Now I really want to buy the book!) Plus there was a pretty cake and a cute baby. Sunday we went to a community concert in the park. I was one of the volunteers and had a very long day from set up, though all the music, to pack up and dinner at the pub. Despite the cancellation of one of the headline acts, it was a great afternoon and made me happy to live in my neighbourhood. 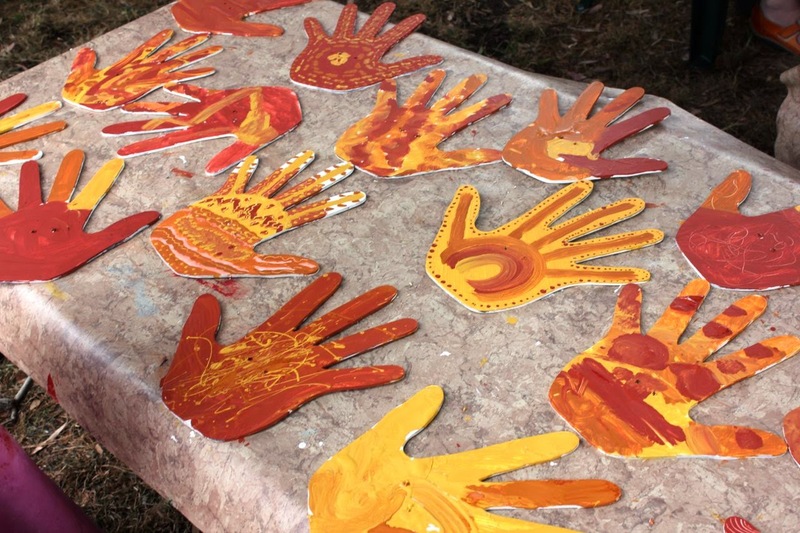 I particularly loved the art tent where kids could paint a hand with Aboriginal colours. I coaxed Sylvia to paint a hand and was rewarded with paint stains on her princess dress that did not come out in the wash! Apparently the painted hands will be on display around Moreland. During the week we made the most of Sylvia's last few school-free Wednesdays (which come to an end when Term 1 finishes up next week) and had a sleepover at my parents' place in Geelong. We had a birthday dinner for my brother. I made a nut roast to contribute to mum's roast dinner. (I know it looks like a bone on my plate in the top photo but it is roasted parsnip). My sister in law made the gf chocolate cake. It was delicious and my sort of thing. Sylvia was excited about the pavolva. 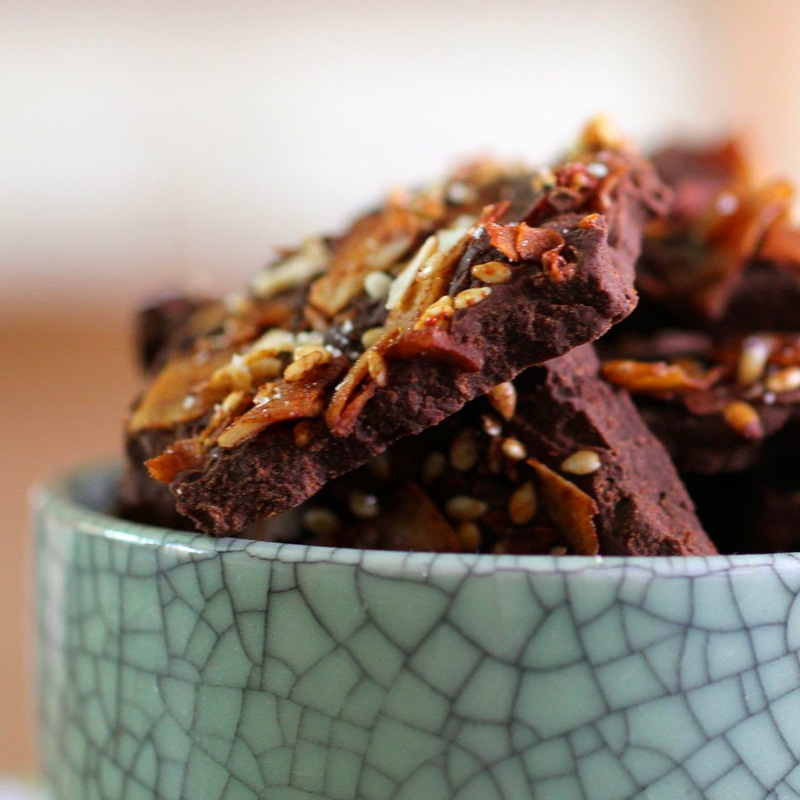 I also took down the chocolate bark with coconut bacon which got mixed reactions. 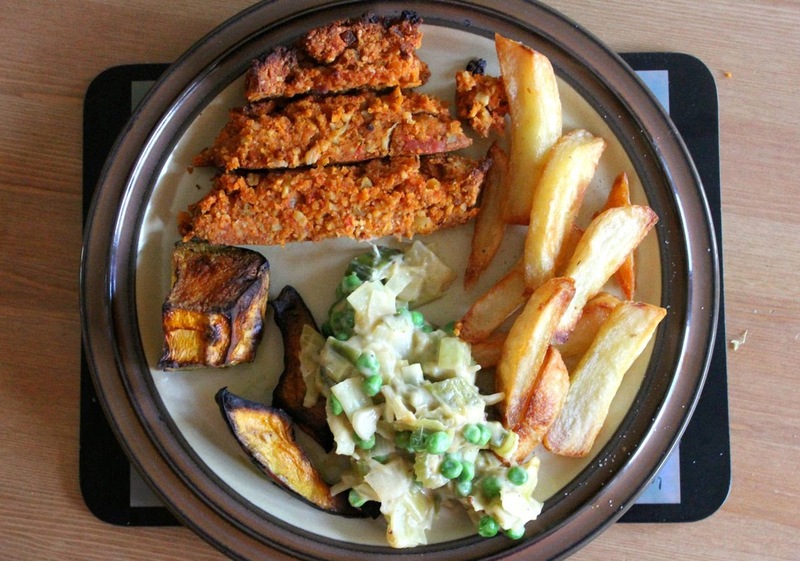 The nut roast inspiration came from Sam Stern's Eat Vegetarian. It was his 'classic' nut roast with a tomato sauce that is mixed in with almond meal, breadcrumbs and chestnuts. I had golden beetroot from the farmers market, I had a gluten free mixture of crumbs (including gomasio, besan and coconut flour), a packet of rice crumbs that has been spilling in my freezer for too long and no chestnuts within cooee. I used cashews instead of chestnuts and made do. The nut roast was a success. It was on the sweet side and quite day-glo orange. But delicious. It was gluten free but regular wheat breadcrumbs could be used. It only had one egg so I think you could substitute a flax egg or chia seed egg to make it vegan. Tonight I made a roast dinner to use up the rest of the nut roast. When I was organising myself to make gravy I found I was out of onions. What self-respecting kitchen doesn't have onions! (Ok, I know some people don't have onions in their diet!) At least I had a huge leek from the farmers market. I took my inspiration from Jamie Oliver and made Creamy Leeks and Peas. I cooked the leeks until soft (about 10 minutes uncovered and 30 minutes covered) on the stovetop with sliced celery, sliced garlic, a dash of smoked paprika and a pinch of salt. (I put some of these aside for another day.) Then I added some milk, parmesan cheese, cheddar cheese and seeded mustard. Mixed it up and added some peas. It was a great side dish. I made the creamy leeks while I roasted the vegies. I sliced the potatoes into chips. Sylvia loved them so much last time I made them and my mum had already made her proper roast potatoes this week. I also roasted some pumpkin. I even heated the dinner plates as my mum used to do. Hence my use of place mats. They haven't been used for some time. I do love the pictures on them so here is a gratuitous photo. The roast dinner was comforting, creamy and crispy. Sylvia ate a decent chunk of nut roast (drowned in tomato sauce) and then told me it was disgusting. The chips were golden and crisp. 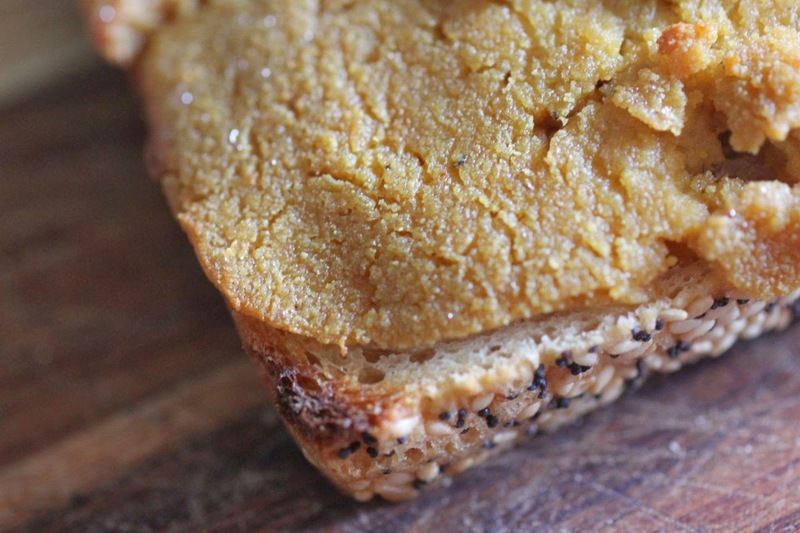 The pumpkin was charred around the edges like it should be when the skin is left on. 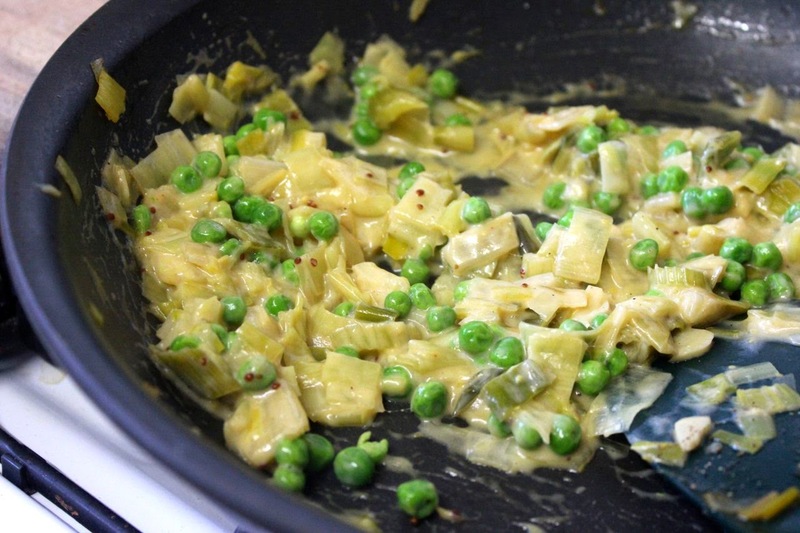 The creamy leeks and peas were an unusual addition to the roast dinner. 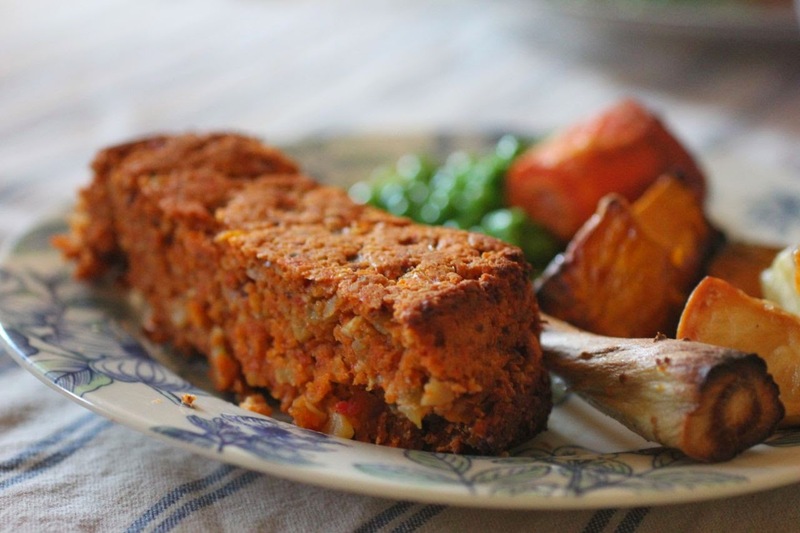 They went very nicely with the tomato and beetroot flavoured nut roast. Every busy week needs an ending like this. 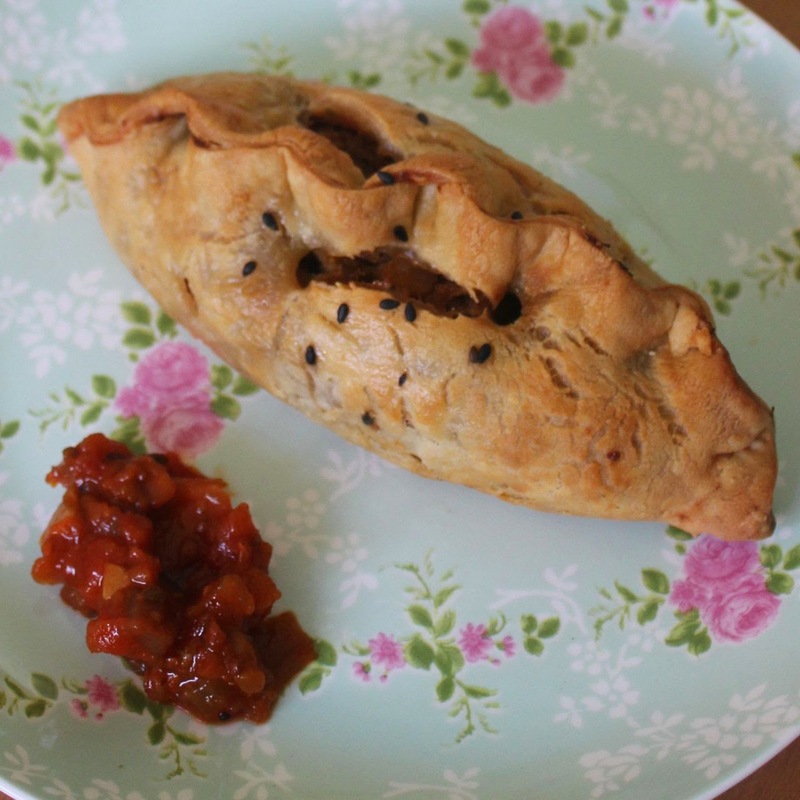 As this meal features golden beetroot and a huge leek from the farmers market I am linking up with Shop Local #7 at Elizabeth's Kitchen Diary, an event for bloggers to feature locally sourced food. Make tomato sauce: Heat olive oil in a medium saucepan over medium heat. Fry onions, beetroot and celery for about 5 minutes or until onion is translucent. Stir in the garlic and fry about a minute. Add tomatoes, maple syrup and sea salt. Bring to boil, cover and simmer for about 20 minutes. The sauce should be thick and the beetroot will be soft when cooked. * NOTES: You could use some precooked tomato sauce with vegies of choice, though it should be quite thick so you might need to boil it down. For the breadcrumbs and rice crumbs you can substitute other grains or flours. 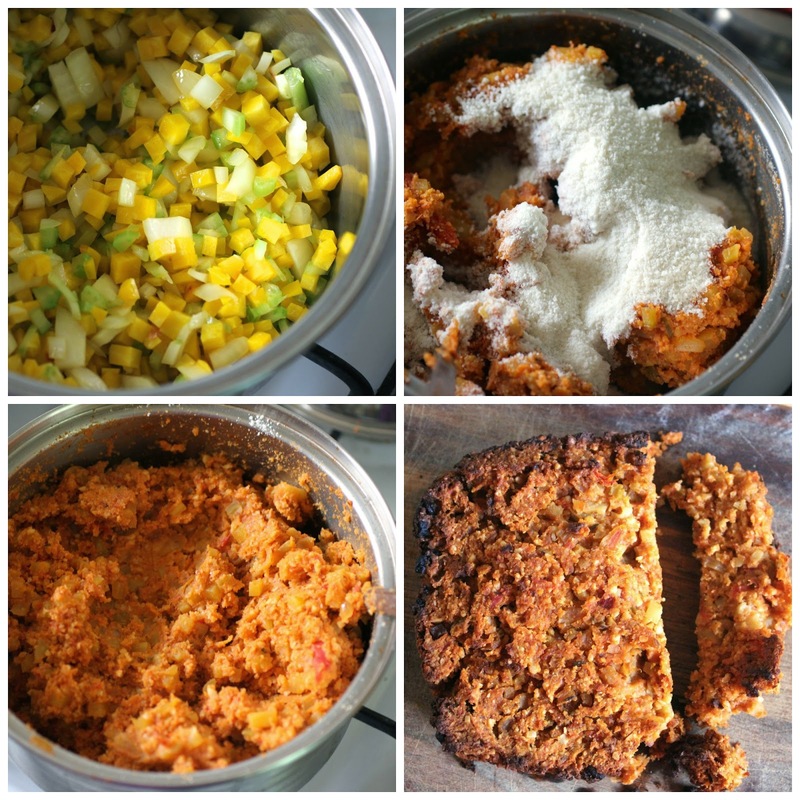 I used a mixture of coconut flour, besan, gomasio and rice crumbs. You could also substitute a flax egg or chia seed egg for the egg (about 1 tbsp ground seeds with 3 tbsp water) to make it vegan. As with all nut roasts, the possibilities for substitutions are endless. Did I ever tell you about the time I won a poetry competition at my college and won dinner for two to Trotters! That was a long time ago. 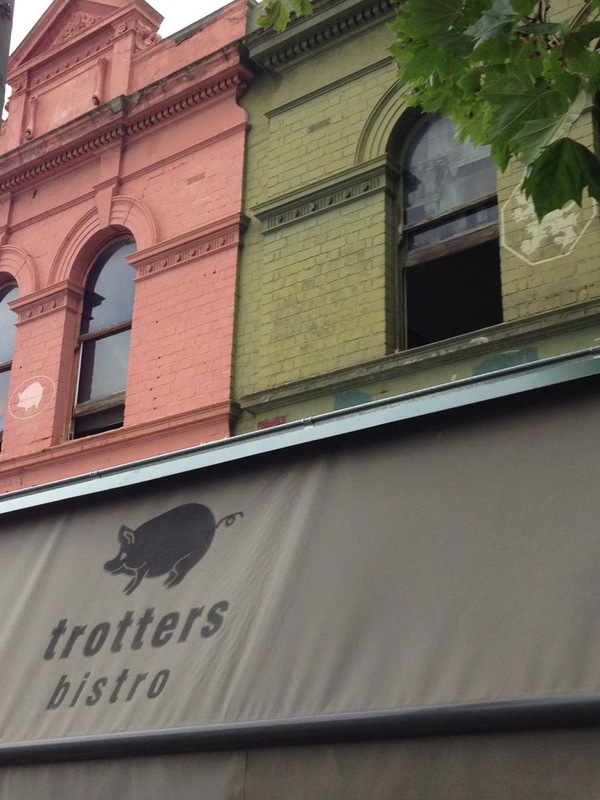 Trotters has been a fixture in Carlton's Lygon Street since I can remember. I have fallen in and out of love with it a few times over the years. I've been there a couple of times lately for enjoyable dinners. Trotters was always a poky place with a soup, quiche and salad sort of menu. It always seemed more vegetarian-friendly than a lot of the Italian restaurants nearby. The cafe was small and crowded in a little terraced building with an upstairs. Recently it has expanded into the next door building and feels far more spacious. 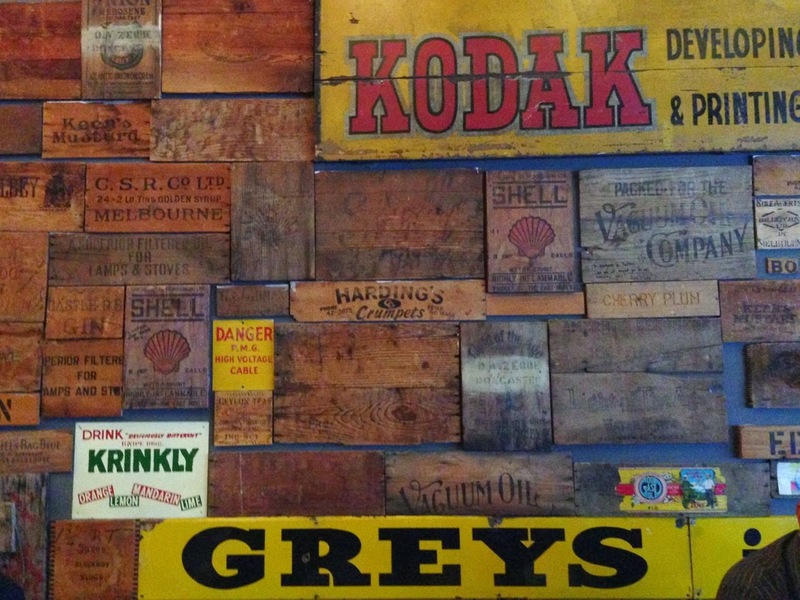 I don't know if the old signs were always on the walls but I really like that ambiance they create. It is close to the Cinema Nova so I have been there after the cinema a few times recently. Last year I ate at Trotters after seeing Enough Said with my friend Heather. I had eaten a light meal before the film so I ordered two sides: polenta chips with chilli aioli and sauted seasonal greens with shaved parmesan. I loved the crispy polenta chips and the aioli bu wasn't sure what to do with the shaved parmesan on it. 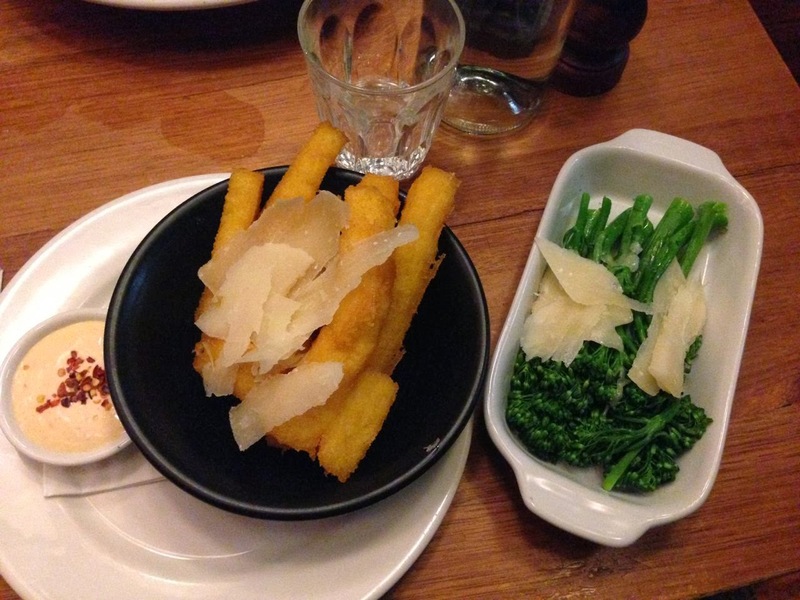 The broccolini was exactly what I needed, though again I didn't quite need so much parmesan. Trotters offers some standard vegetarian meals: the vegetarian burger, a risotto and eggplant parmigiana. It is the sort of choices that I can find comforting or boring depending on my mood. 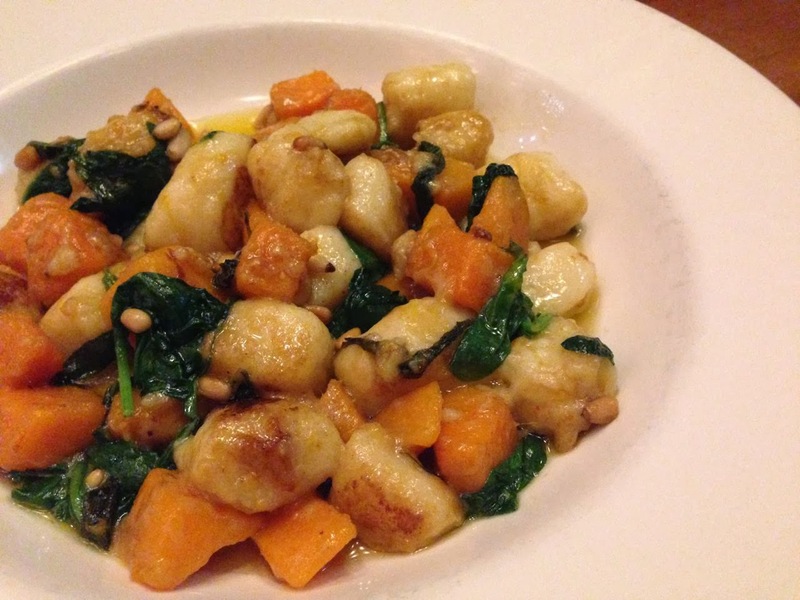 However it appeals more than some of the other offerings on Lygon Street. The real disappointment at Trotters was the dessert. There is no appealing chocolate option. 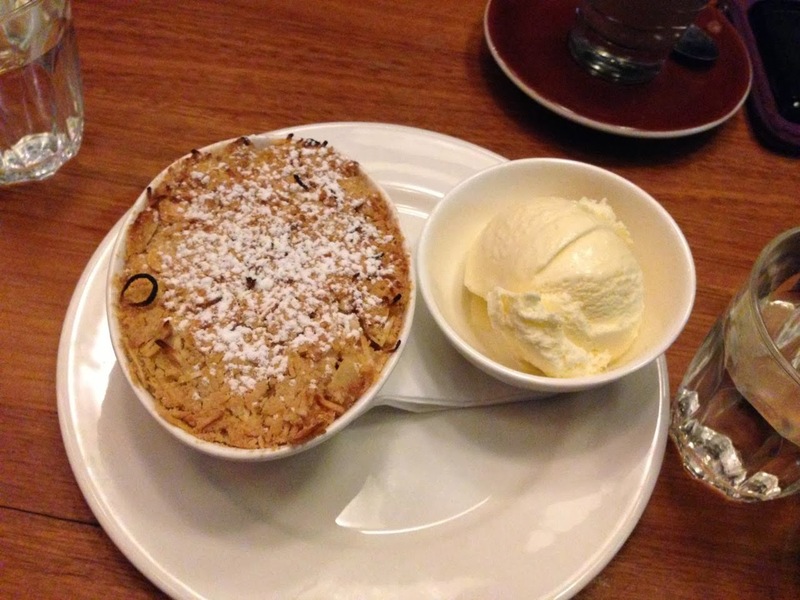 We decided to share the apple crumble with ice cream. The crumble was nice but a bit on the dry side and really needed the ice cream. My other recent visit was early in the year when E and I went to see Inside Llewyn Davis. We went for the pizza menu and I would definitely recommend this. The hand stretched organic spelt pizzas seem a tad more modern and exciting than the rest of the menu. I had the Ortolana pizza, which came with tomato, mozzarella, zucchini, capsicum, eggplant, cherry tomatoes, mushrooms and provolone. Roast vegies can be done really badly on a pizza but this was excellent. The base was thin but satisfying (and not baked to a crisp like a recent pizza I had a pub)! E ate the outside first in case he was full but I really loved the crust. It was filling enough that I couldn't finish mine. E thought the spelt base was lighter than regular pizza bases. Trotters is one of the cafes on Lygon Street that makes me feel nostalgic for times when I spent so much more time in that area and a little pleased it is still going strong. I have really missed the Vina Bar ever since it shut (despite great other cafes nearby). However its Vietnamese cuisine sat a bit oddly in the Italian strip of cafes. 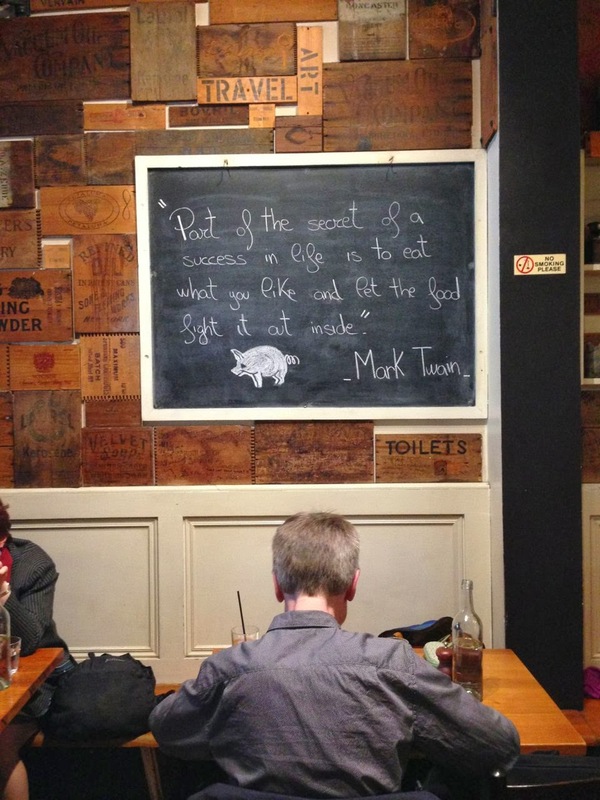 Trotters seems the perfect cafe for Lygon Street. 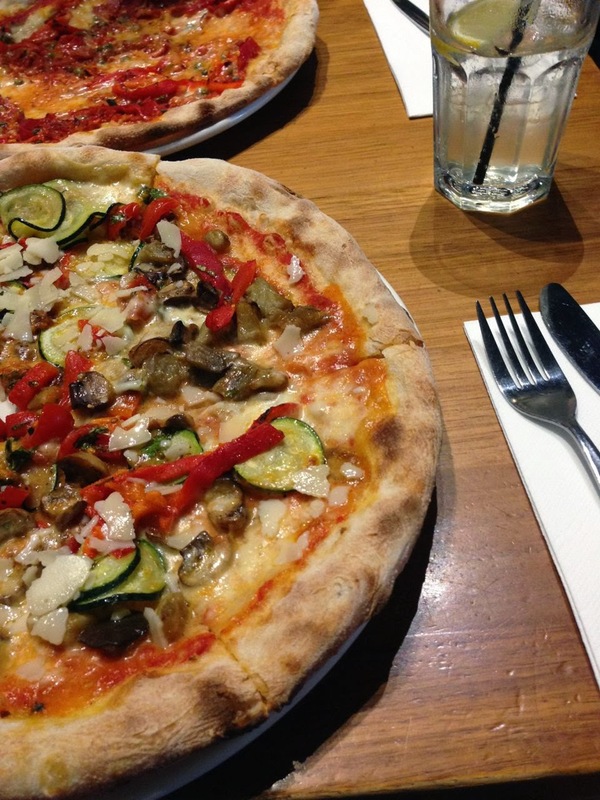 A little bit student chic, a little Italian, a little modern and generally good food. Now if only I could still write the sort of poetry that would win me a meal there. Busy times call for simple recipes. Today have two that are related. 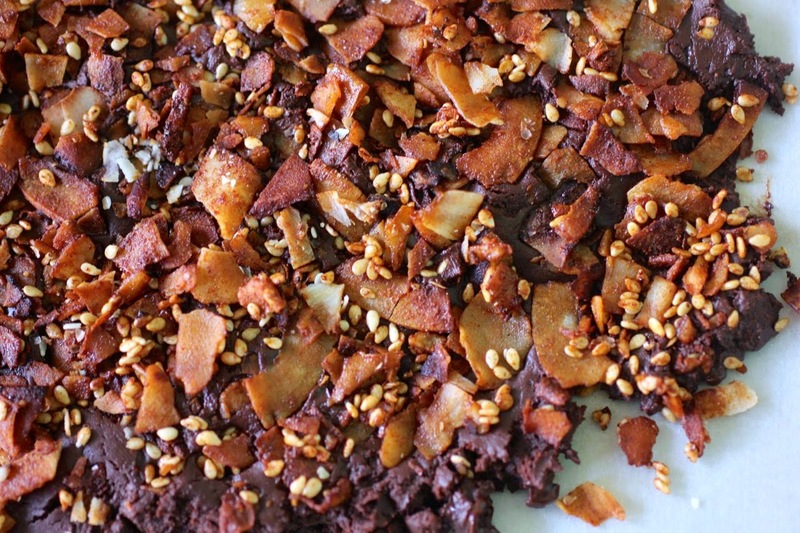 I have had my eye on a Vegan salted dark chocolate bacon bark. It uses a commercial coconut bacon. I sometimes make my own coconut bacon. 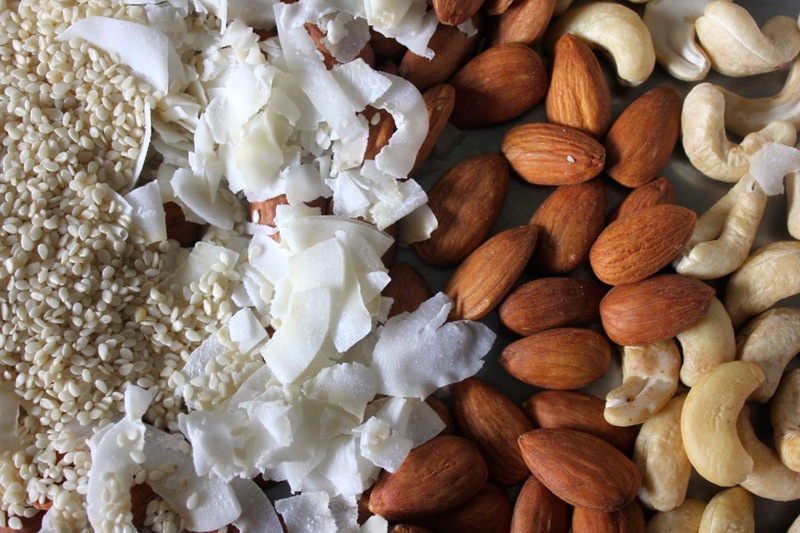 But this morning I wanted to experiment with roasting smoky nuts and coconut bacon. Suddenly I had the light bulb moment and realised I didn't have to make coconut bacon. It was already made. 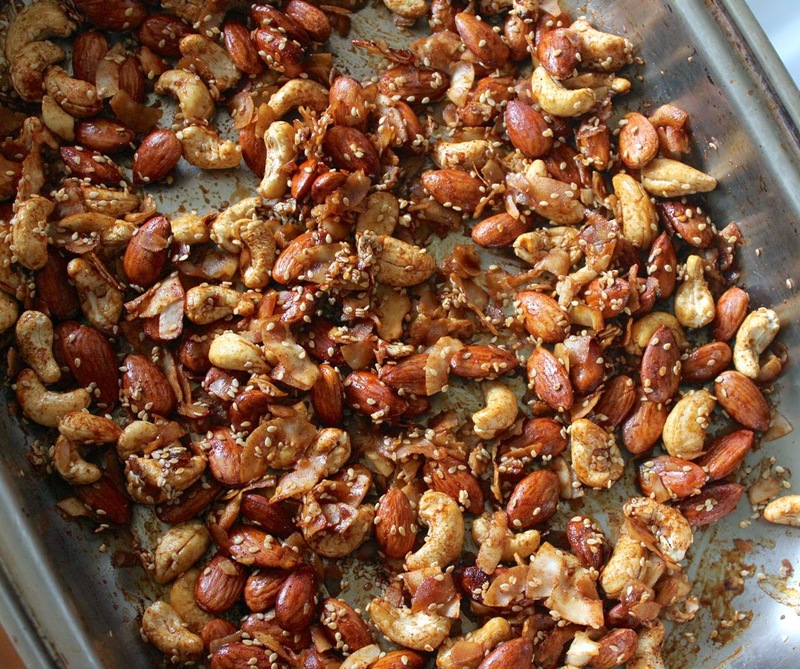 I saw the recipe for Smoky and spicy nut, sesame, and coconut ‘bacon’ bar nuts at Oh She Glows recently. 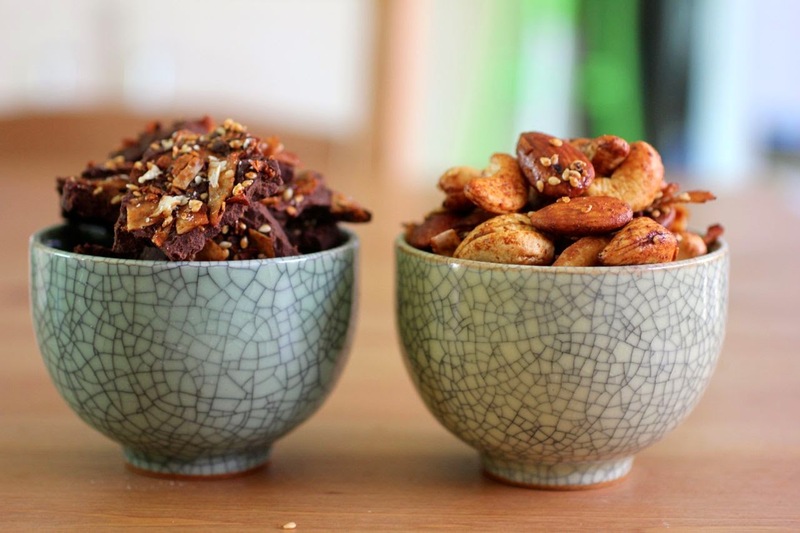 Angela make amazing recipes and yet I was still swooning at the brilliance of combining smoky nuts and coconut bacon. I first made the smoky nuts on the weekend for a party. I used a variety of nuts - almonds, pecans, hazelnuts and walnuts - because I didn't have the cashews and coconut flakes. It was overcooked and I had to discard the darkest nuts. Yet they seemed quite popular. Only Sylvia wasn't keen because they were too spicy for her. So I made them again without the spicy element. The smoky nuts and coconut bacon was so easy to make I had it made before I had hung out the washing. I scooped some of the coconut bacon and smoky sesame seeds out of the pan. I then did a terrible job of melting the chocolate. Seems there was a reason that you melt the chocolate before adding the maple syrup and coconut oil (mine got a little stiff which made it harder to get the coconut bacon to stick but it still tasted amazing). 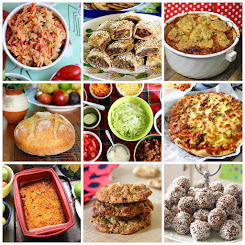 Both these recipes taste amazing and make fantastic food to share or unusual gifts. 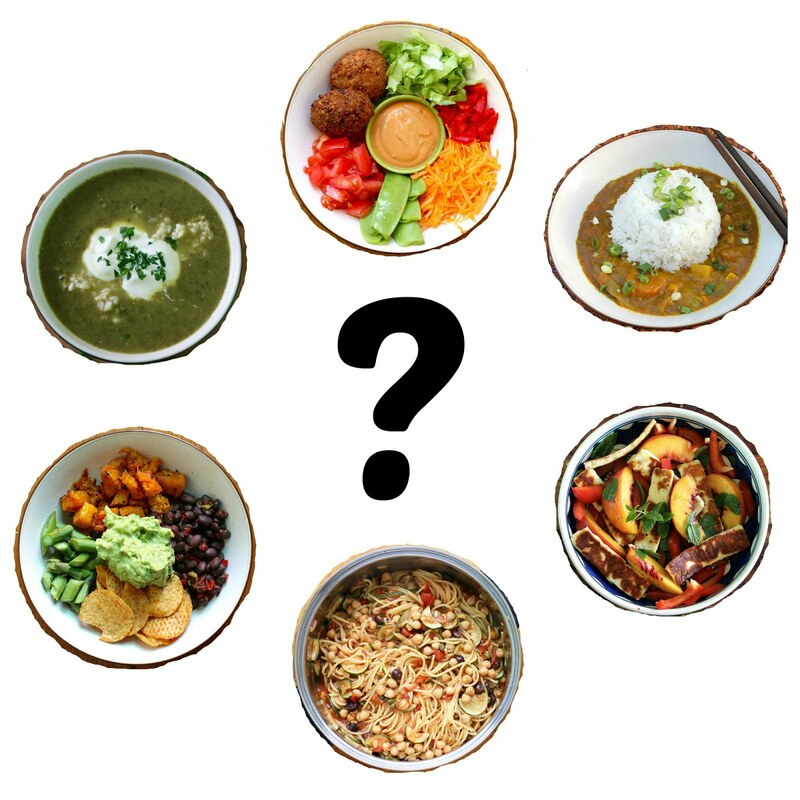 They would go down especially well with vegetarians or vegans who love smoky flavours and dream of veganising all those meaty bacon recipes. (Oh yes, that is me.) And best of all, they take barely no time at all. I am sending these chocolates to Laura at I'd Much Rather Bake Than ... for We Should Cocoa. The theme this month is coconut. Preheat oven to 170 C or 325 F. Mix everything well in a large roasting dish. Roast for 10 minutes. Stir well. Roast another 10 minutes, stirring again at the 5 minute mark and checking it isn't too well done. Cool and store in an airtight container. *NOTE I used scooped out coconut bacon and sesame seeds from the Smoky seedy coconut bacon nuts above. It was pretty easy to take a scoop because the nuts rose to the top and could be taken off. You could just use regular coconut bacon by making your own or buying some, and should do this if you are making it for anyone with nut allergies. Melt chocolate and then stir in maple syrup and coconut oil. Spread on baking paper on a baking tray. Sprinkle with coconut bacon and seeds. Sprinkle with pinch of sea salt if desired. Set in fridge or freezer - I think mine took about 15 minutes in the fridge. Break up and store in air tight container. 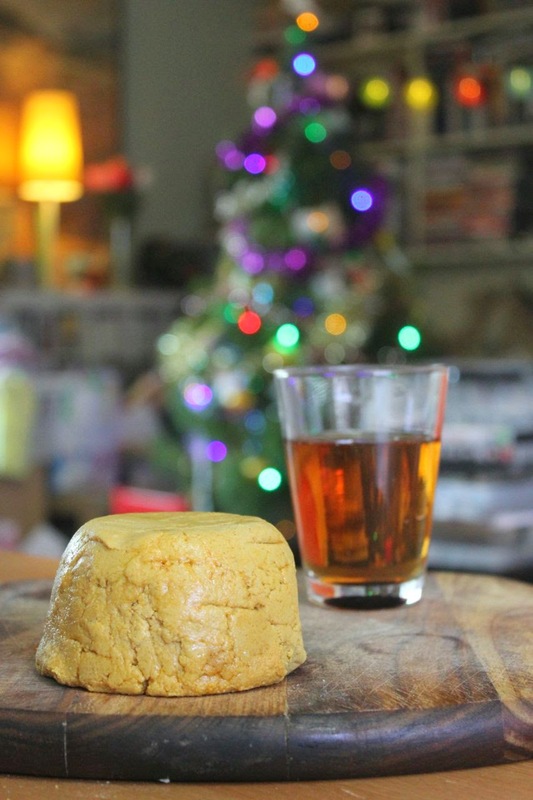 So today I am posting about some vegan cheese that I photographed months ago with a Christmas tree in the background. 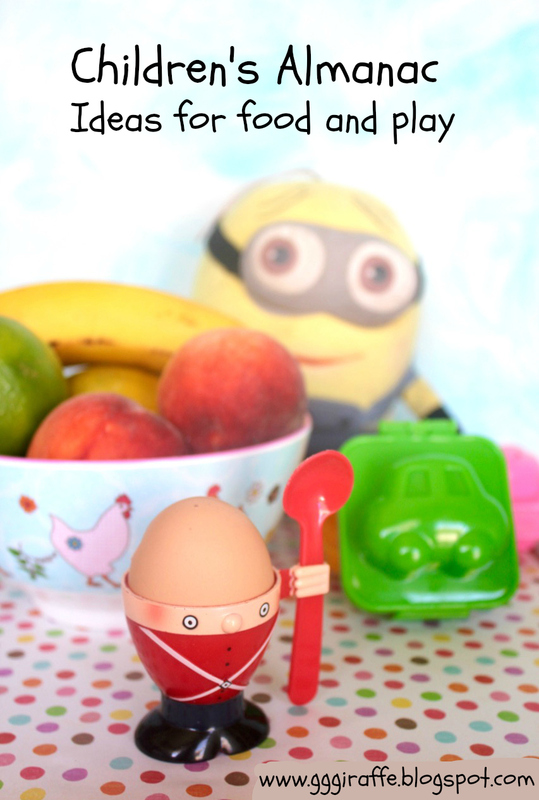 It has been languishing in my blog backlog for some time but it has also been waiting. 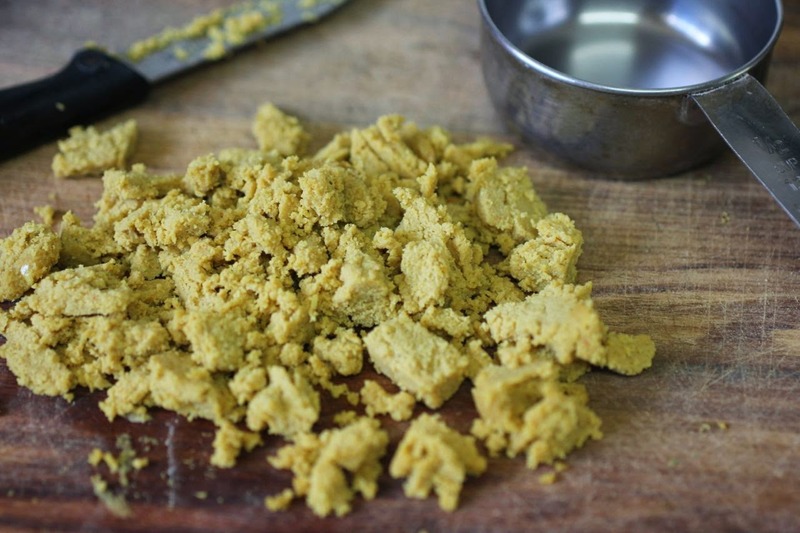 I have made a few vegan cheese before but never fermented one. So I left this in the fridge for months. It was there so long I would forget about it. I didn't feel I got the texture quite right but I loved the flavour. The problem with writing about this cheese so long after making it is that my memories of it aren't that sharp and I am relying on my notes. 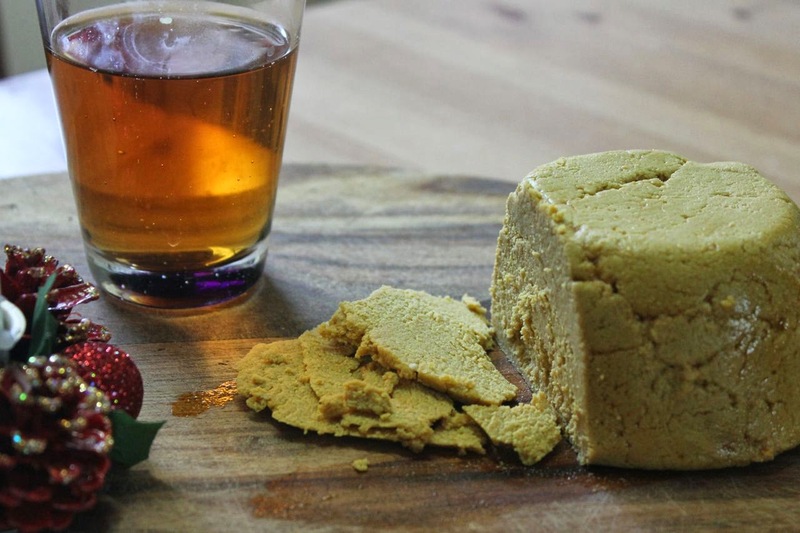 I bought Artisan Vegan Cheese by Miyoko Schinner last year and am intrigued by her cheeses. However the recipes aren't that straightforward. I finally decided to avoid the few days needed to make the rejuvelac base (see the recipe online at Go Dairy Free) after I noticed a few recipes using sauerkraut in cheese. Apparently it has some of the same probiotic qualities. 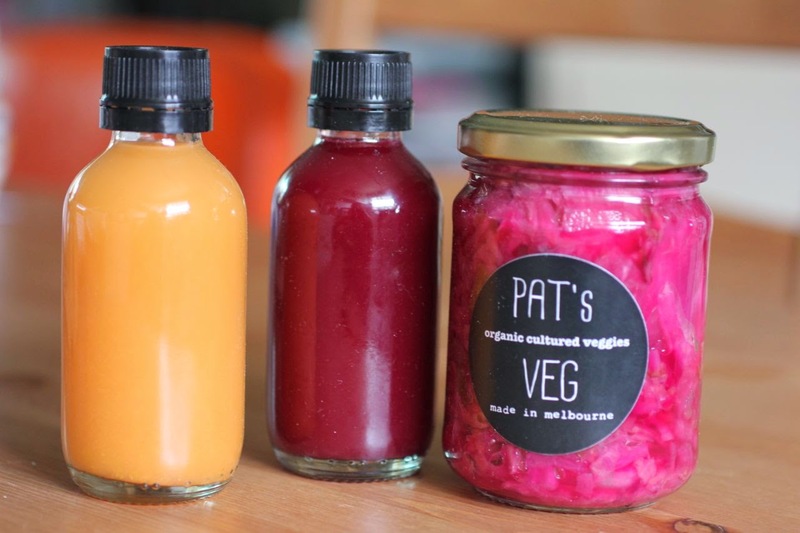 And I happened to buy some sauerkraut brine and kimchi brine from Pat's Veg at the Coburg Farmers Market. I was not quite sure if the beetroot sauerkraut or kimchi brine was better. I used a bit of both. I got paranoid it would be too cabbagey or too pink. Yet the mixture had those lovely spongy texture after 12 hours at room temperature. That is a sign of the mixture producing gas that creates air bubbles in the mixture. I made a note of the flavour changing after the fermentation. More worrying was that it was grainy and never reached the smooth and glossy texture. I wondered if it was due to my blender not being powerful enough to blend the cashews. Then I was patient. I left it in the fridge for over a month. Then I had some with ginger ale and bread. It sliced up quite well but was a little crumbly. I am not sure the texture changed much after this. I think the flavour did develop though. The unmami savoury taste of cheese was impressive. When I tasted the cheese after about 2 months in the fridge I worried it had gone a greyish colour but it tasted good. It was also a bit soft around the edges. I tried to grill it and there was no goo factor. Just that dry cracked desert soil look. I also tried it on a pizza and it didn't add much. This was disappointing because I had added oil because it was suggested this would help it melting (though to be fair Miyoko also suggested that other cheeses in the book were better if you are really after melting cheese). The oil seemed to make the outside of the cheese really greasy. I wondered if this was shy it was so soft around the edge. Next time I would not add any oil. I have tried the cheese in a few sandwiches and enjoyed it. Sadly I never got to try it in a reuben sandwich. I did make this very satisfying sandwich of cheese, leftover roasted zucchini skin, baked sweet potato slices and tomato. red pepper. Let me digress a moment to illustrate mainstream attitudes to vegan sandwiches. A while back I was listening to high profile Australian chef, Curtis Stone, talking about going on Oprah's show to make a sandwich for a fan. He had lots of plans for making a meat and seafood sandwich. He arrived and found the fan he was cooking for was a vegan. He was flabbergasted. He made a falafel sandwich. What shocked me was when he said, what else could I have done! Huh? 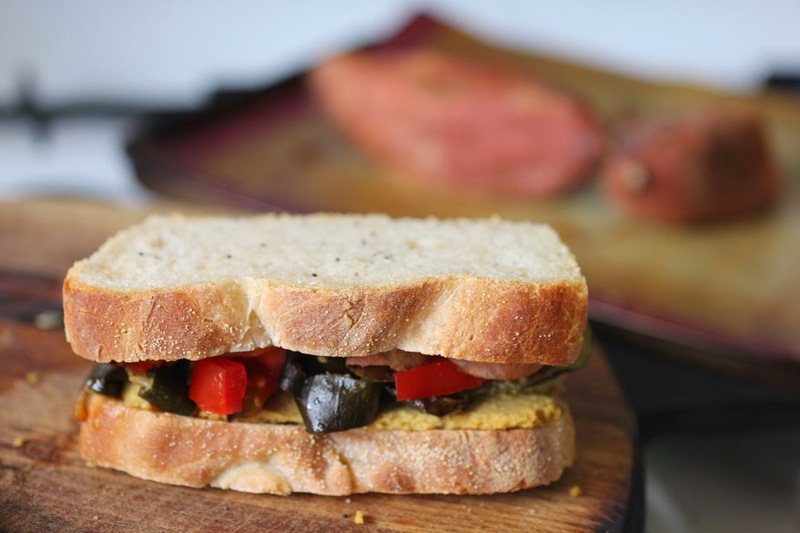 There are so many fascinating vegan sandwiches out there. Then I forgot about the cheese. With a start I remembered it had been in the back of the fridge for months. (A day or two over four months if you want to be precise.) I had a look and it had a mark like mould on it. Isn't cheese just mould anyway? Well I wasn't going to throw out this cheese I had worked hard on. I trimmed it and it looked fine. I gave E a taste and he made a comment about it being tasteless. Hurumph! I used it in a warm spinach dip anyway. It definitely adding lots of flavour to the dip. You can see below that it also went well with the spinach dip and an oatcake. So great taste but not so good on the texture. While not an overall success, I enjoyed experimenting with this cheese and would be interested to try it again. I am also interested in other cheeses from Miyoko's book. It still seems like quite an undertaking so I can't imagine it would be a regular cheese for me. However I am excited by vegan cheese and will continue to explore it further. 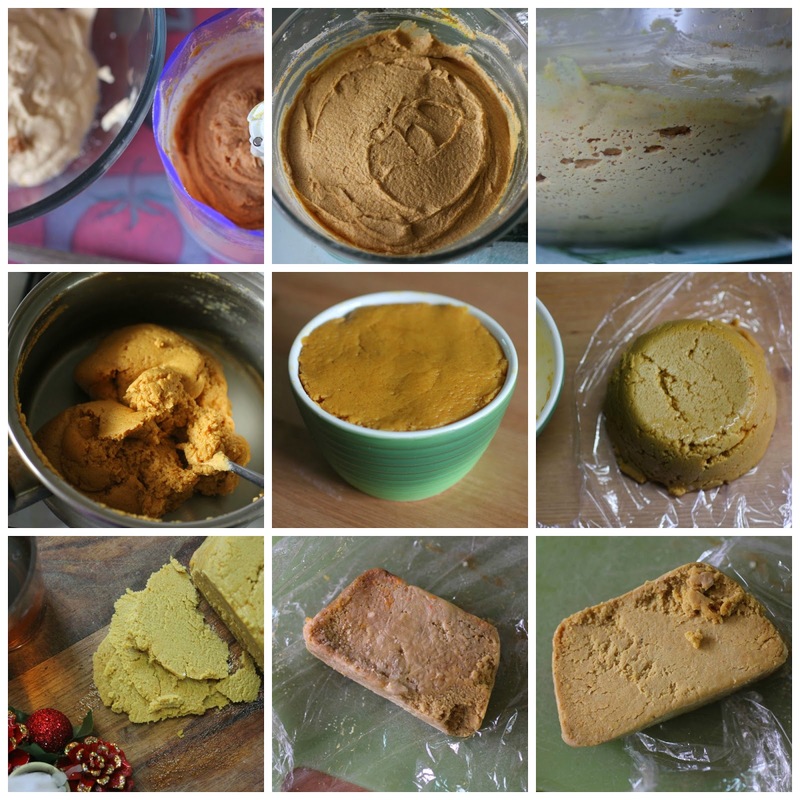 Above: a photo journey of my sharp vegan cheddar cheese. Top row (L to R): 1. I blended my ingredients in two batches because my blender is so little. 2. Then I mixed the two batches together. 3. I left them at room temperature for 2 days and the mixture became spongy with air pockets. Middle row (L to R): 4. I mixed the 'cheese' over the mixture in a saucepan until it pulled away from the edges. 5. I tipped it into the ramekin to let it set in the fridge. 6. Once cool I tipped it out and wrapped it in cling wrap and kept it in a zip lock bag in the fridge. Bottom row (L to R): 7. I tried slicing it at just under 2 months. 8. At just over 4 months it seemed mouldy on the outside. 9. When I trimmed off the edges it still was quite good inside but needed to be used. I am sending this cheese to Ricki Heller's Wellness Weekends. 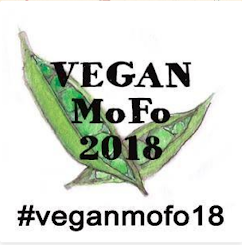 I am also sending it to Healthy Vegan Fridays, hosted by Suzanne at Hello Veggy, Anna at Herbivore Triathlete, and Kimmy at Rock My Vegan Socks. 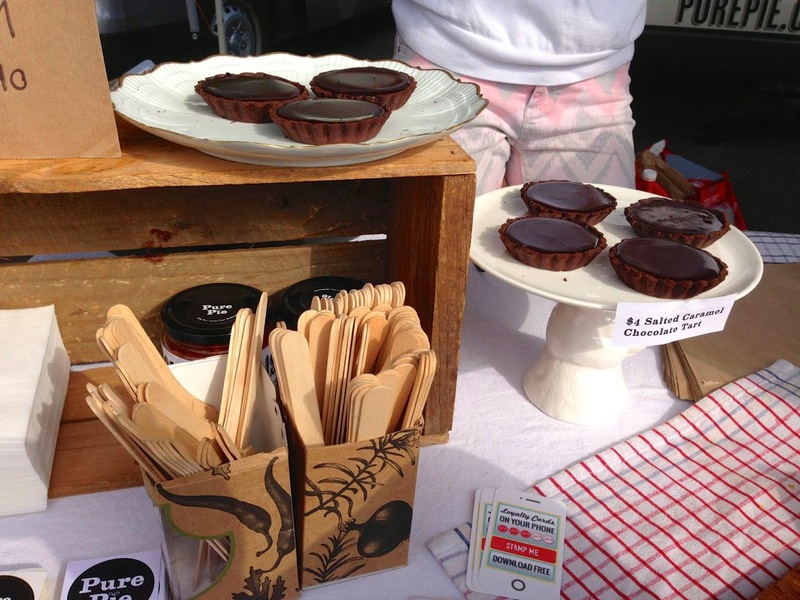 One year ago: Great avocado salad dressing, ho-hum "meatloaf", and CERES baking competition. Makes about 250ml of cheese. Blend all ingredients except the xanthum gum and agar until smooth and creamy. (I forgot to leave out the agar and xanthum gum so everything went in for me.) Transfer to a glass bowl and set aside at room temperature for 24 to 72 hours, depending on how sharp you want the cheese (the longer the sharper - I left mine 2 days). Transfer to a saucepan and cook until glossy and pulling away from the sides. Miyoko suggests about 5 minutes but I did it for 8 minutes and it was still a bit grainy in texture. Transfer to a container and store in the fridge. Once it was cool and firm I tipped it out of the ramekin, wrapped it in clingwrap and stored in the fridge in a ziplock bag. The recipe suggests leaving in the fridge for up to 4 months and that it will firm up especially after 3 months. *NOTE: I found that the cheese was quite greasy and I would not add the oil next time. I might have been bang on time with St Patrick's Day this year. For the disorganised among you, take heart. I was late with St Valentines Day and today am even later with Shrove Tuesday. They are not even proper pancakes. These pikelets are as close as I got. While I had wild dreams about creamy vegetables wrapped in thin pancakes or rich chocolate pancakes with caramel and pecan sauce, these humble pikelets are more my sort of thing. I added choc chips because everything tastes better with chocolate. I think! In fact I made them twice. The first batch came from Coles supermarket and were yummy but much thinner than traditional pikelets. (Yes they are as thin as the ones on sale in the supermarkets but they don't really know about tradition, do they?) Later when I looked at the recipe I found that it had quite a bit of melted butter unlike my favourite pikelets recipe. The pikelets were made for a kids party in the park. 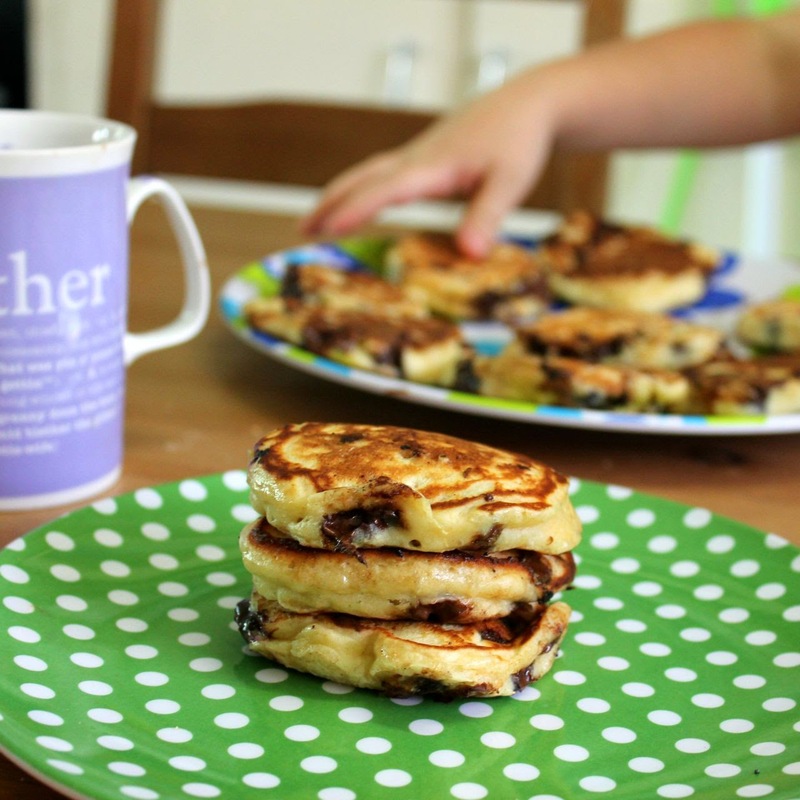 I was glad that pikelets are a doddle to make as I made them just after Sylvia put a coin in our CD player. So I made them just before we left. Ideally I would have cooled them more so they didn't go soggy when piles on a plate. They were quite floppy anyway. 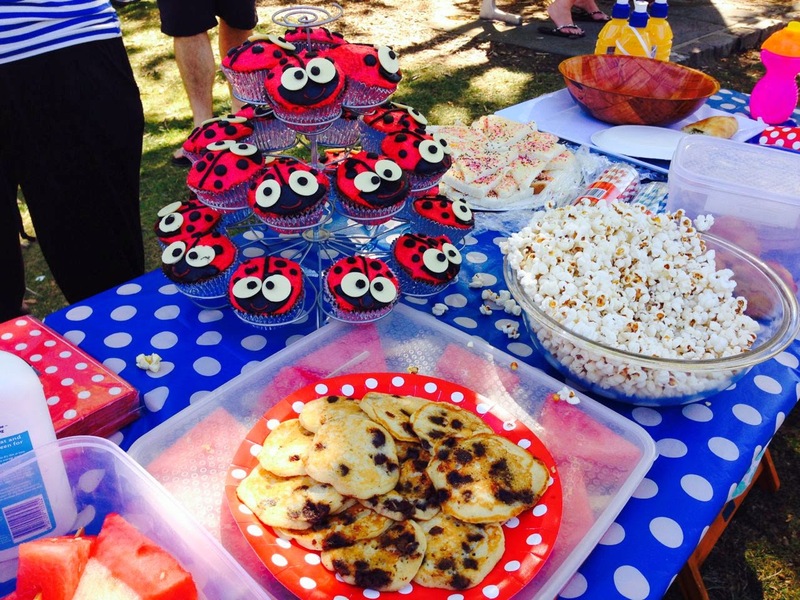 The food at the party was great - popcorn, strawberry ice cream, watermelon, fairy bread and the gorgeous ladybird cupcakes. It was lovely to relax in the park and catch up with some of the parents from Sylvia's class. 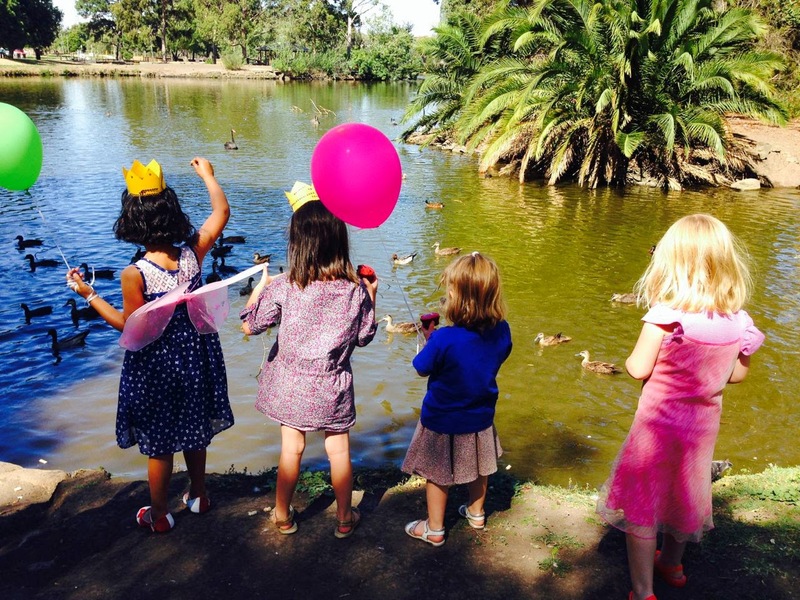 She loved the make-your-own-crown activity, feeding the ducks and the balloons. After holding her own party in the park recently, I was impressed at the effort gone into this party. I was also glad to find that Sylvia is not the only birthday girl who isn't comfortable with the attention of singing happy birthday. I forgot to put aside any pikelets for E in my hurry to get to the party. So the next weekend we decided to make them again. 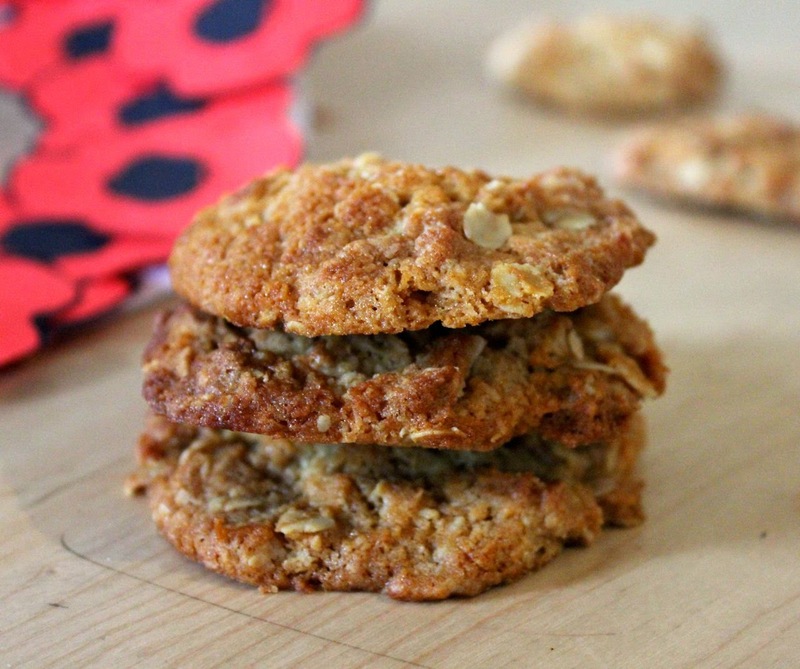 These ones were more like my regular ones but using some yoghurt and oats. I burnt most of them on a low heat and found that the ones that were golden brown were heated on a higher heat. 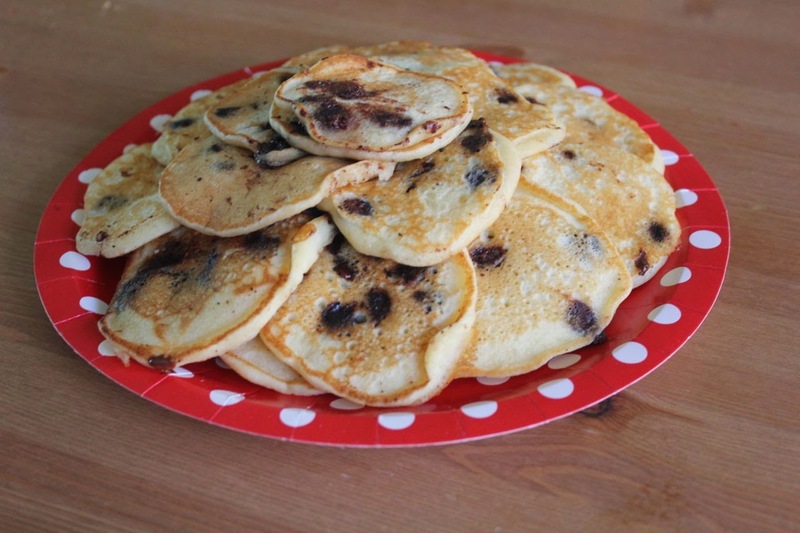 However like the previous batch of pikelets, the choc chips melted as they cooked and made for a messy frypan and a messy plate. Sylvia was very keen to help fry the pikelets but I found it easier when E took her off to read a book while I flipped them. We gobbled them up quickly and I put a few away in the freezer for school lunches. However I didn't love them as much as I thought I would. 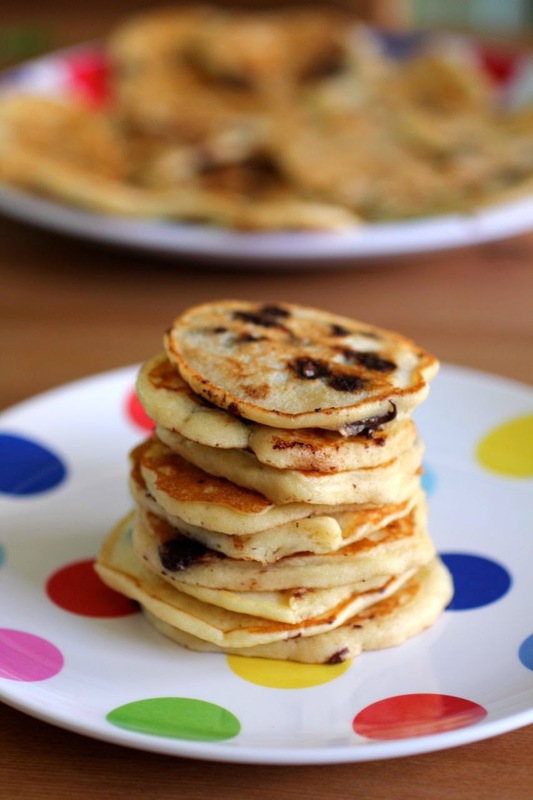 I had moments of being unsure that choc chips really belonged in chubby pikelets. Perhaps the more buttery thin ones were more appropriate. I am still not sure. I can attest to finding them rather moreish despite my misgivings. I guess I will have to make another batch just to make sure. I suspect I will still like them. 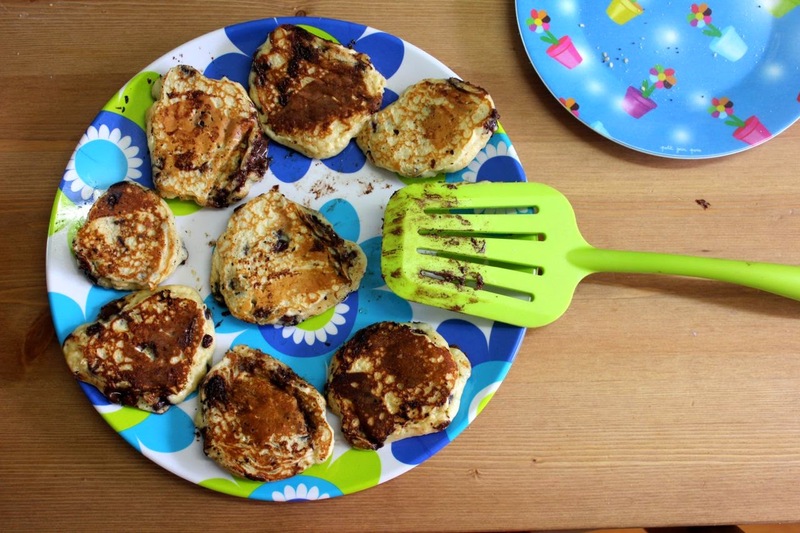 Whatever I feel about them with choc chips, I will be adding oats to my regular pikelets. I am sending this to Recipe of the Week at A Mummy Too. Mix together the dry ingredients in a medium mixing bowl. Whisk together the milk, egg and melted butter in a small mixing bowl or large jug and pour into the dry ingredients. Mix to make a thin batter. Heat heavy based non stick frypan over medium heat and swirl a little melted butter over the base to cover the pan. Drop tablespoons of batter into the frypan (they spread quite a bit). Flip over when the mixture bubbles and then fry on the other side another minute or so until golden brown. Mix together ingredients to make a thick batter. Heat heavy based frypan over medium high and swirl around a small knob of butter to just cover the pan. Drop dessertspoons on the pan, making about 4 to 6 pikelets at a time. 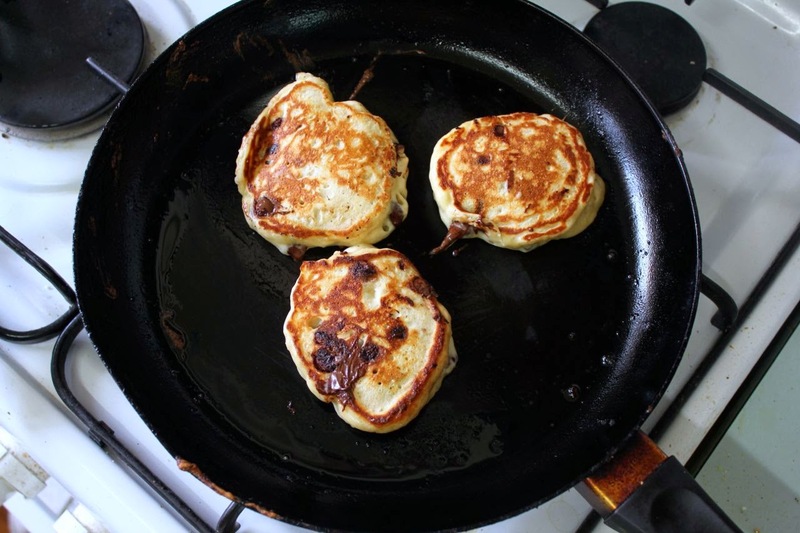 When the batter slightly dries and a few bubbles form, flip the pikelets over and cook another minute or two until golden brown on the other side. Eat warm or at room temperature. Best eaten on day of making. 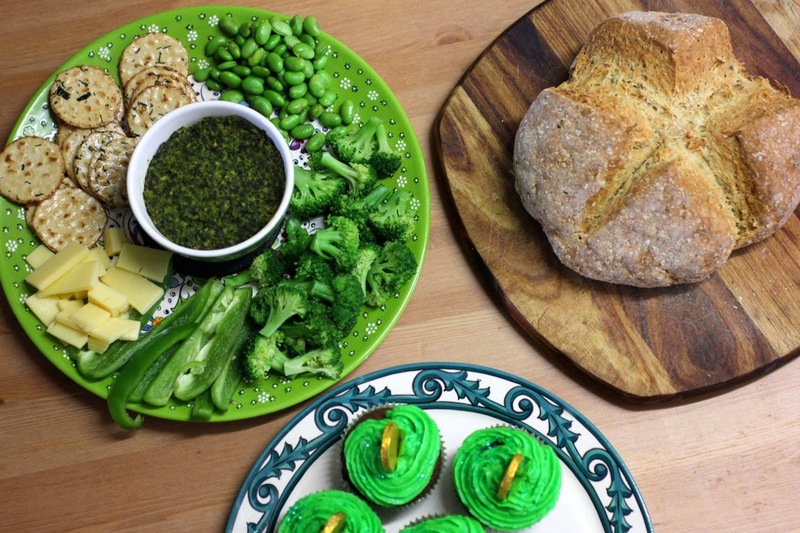 St Patrick's Day dinner: cupcakes, spinach dip, soda bread and lots of green! St Patrick's Day might not have been celebrated in our workplaces and schools but at home we ate green and wore green and listened to Irish music. 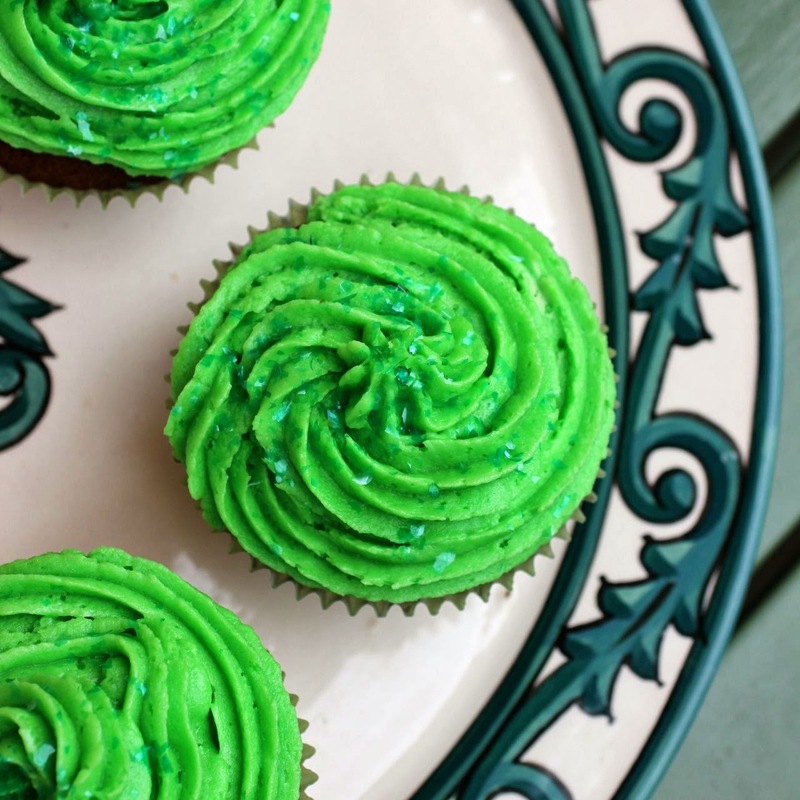 Yesterday I made spinach dip, cupcakes and collaborated with Sylvia on a shamrock banner. I was pleased to be organised today and to use up leftover buttercream frosting. Mostly I just loved celebrating green! I should make a disclaimer here. I was so excited about all the green possibilities that Sylvia started calling it green day. So I did talk to her about St Patrick and disabuse her of the notion that St Patrick might be Jesus' dad. (Well she knows he has two dads. One is god but she forgot Joseph's name!) We also talked about Ireland. This is her heritage, after all. 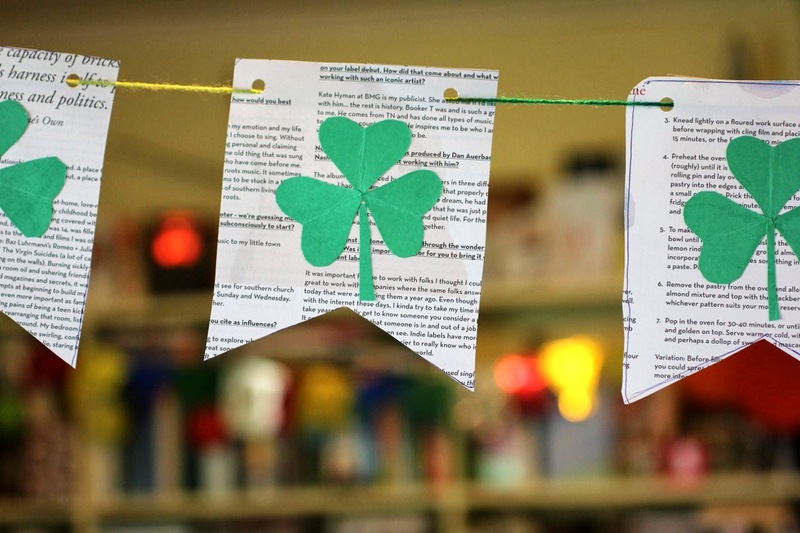 Sylvia and I made a banner as a St Patrick's Day craft project. We were inspired by Lil Luna. It was made of old magazine pages, green cardboard (cut into heart shapes that then formed the shamrocks) and wool. I had leftover buttercream frosting from Sylvia's birthday cake. It was a happy moment when I realised I had green icing in the fridge and St Patrick's Day almost upon us. 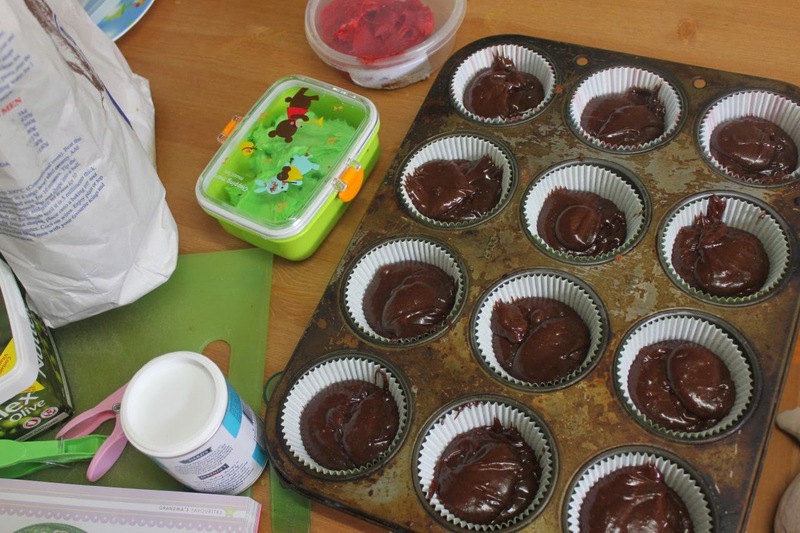 Then it was only a matter of finding a chocolate cupcake recipe to display the icing. I found a recipe in a favourite cupcake cookbook (Cupcakes Galore). It was for brownie cupcakes. I made quite a few changes, including leaving out walnuts so Sylvia could take one to school for lunch. (I meant to add white choc chips instead but forgot.) They were rich and dense but a bit dry without icing. The original recipe called for a ganache. But I had icng to be used. Best of all was that I actually did some swirly green icing to make me feel proud. I haven't had much success with this sort of icing in the past. The silicone piping bag with nozzles to fit is one of the best solutions I have found for my piping incompetence. 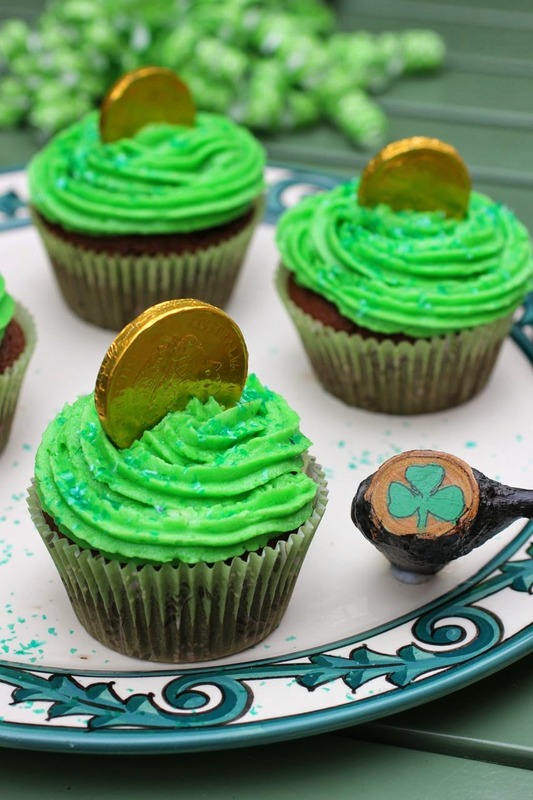 I came across the idea for putting gold coins in the frosting when googling St Patrick's Day cupcakes. I understand it is connected with the myths of leprechauns storing gold coins in a pot at the end of the rainbow. It seems a bit far from St Patrick. However Sylvia had the coins and it seemed like a fun idea. Sylvia loved it! I made a loaf of seeded soda bread tonight. I found it in Betty magazine. I think it was aimed at people who don't cook much. It is that easy. 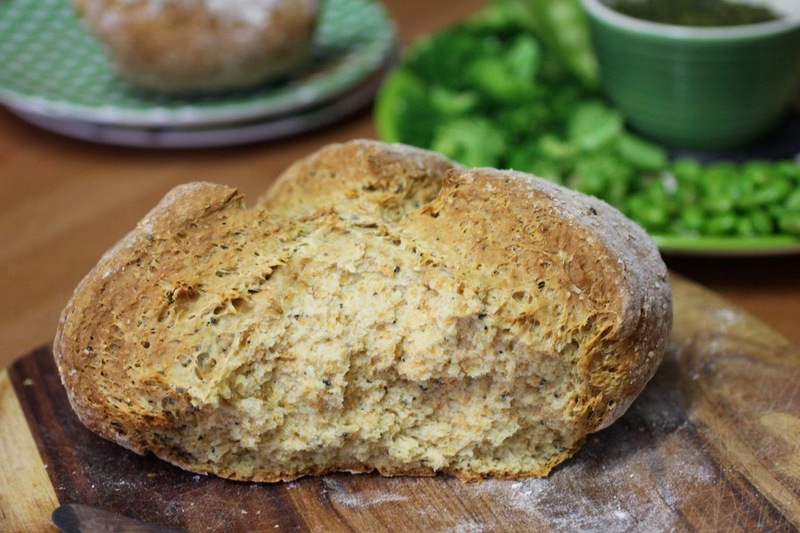 Soda bread seemed a nice Irish touch for our St Patrick's Day menu. This one was soft, bready, crusty and so yummy. I made changes because I didn't have all the 400ml yoghurt required. Yoghurt or soured milk or buttermilk would all work here. I liked the options to use any seeds. The nigella seeds I added gave a slightly spicy flavour but subtle enough to fly under Sylvia's sensitive kiddie radar. I also added a couple of good pinches of salt. Lastly I reheated the spinach dip I made last night. It is the sort of recipe I often see. It was vibrantly green. Perfect for St Patrick's Day. I was quite pleased to use up some soaked beans, some greens, and some home made vegan cheese (which I will write about eventually). It wasn't as creamy and heavy as I fear some of these dips are. It did taste a little grassy. I am not sure I would recommend it to convert spinach haters! It was rather healthy though. And green! I am not used to warm dips. This one only went in the oven for 15 minutes. I thought it might change the texture and taste slightly. Make it meld more. It merely seemed to heat it through. So I just reheated it tonight. It does taste better heated. At least with minimal heating, it keeps its green colour. It was fun to celebrate St Patrick's Day with a special dinner. I made a platter of the spinach dip with broccoli, edamame, green capsicum, cheese and rice crackers. We tore apart the bread with our hands. (Sylvia had vegemite on hers in a distinctively un-Irish fashion.) Sylvia loved having a meal that she could serve herself. We all loved the cupcakes. Then E finished off the evening with a rendition of 'Molly Malone'. 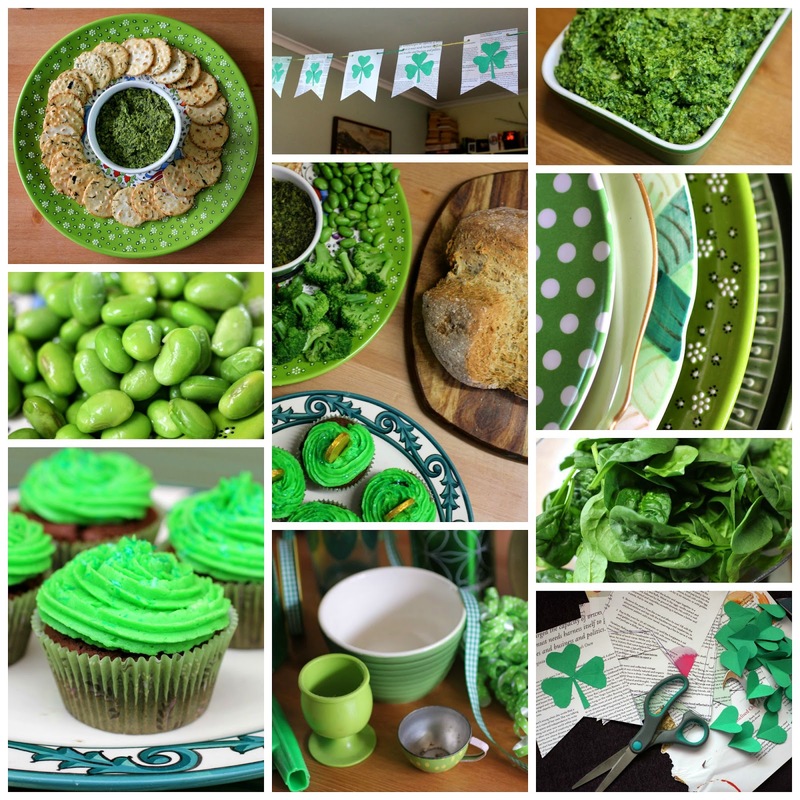 I have also posted more ideas for St Patrick's Day green food. If you want some Irish music and lovely Dublin images, you should check out the video clips of Falling Slowly by Glen Hansard and Markéta Irglová. 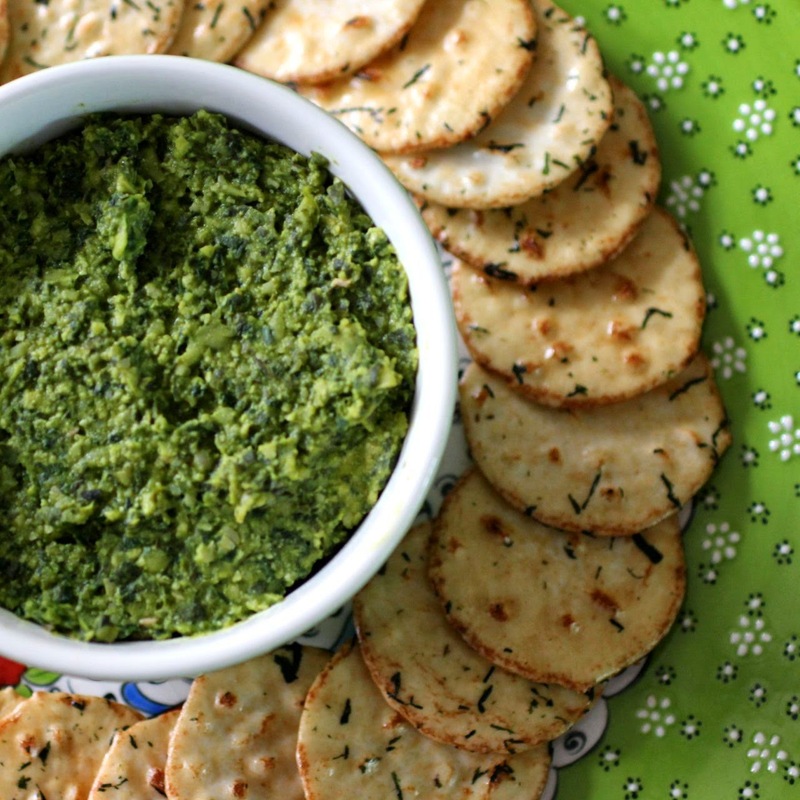 I am sending the spinach dip to Ricki Heller for Wellness Weekends. I am sending the cupcakes to Kat for Treat Petite (cohosted by Cakeyboi). This month's theme is Ireland. Preheat oven to 180 C or 350 F and dust a baking tray with flour. Mix dry ingredients. Pour in wet ingredients. Mix in bowl and tip out onto floured surface. Knead briefly until the dough is smooth. Flatten slightly and place on floured tray. Cut a deep cross with a sharp knife. Bake for 45 minutes or until the crust is deep brown and sounds hollow when tapped. 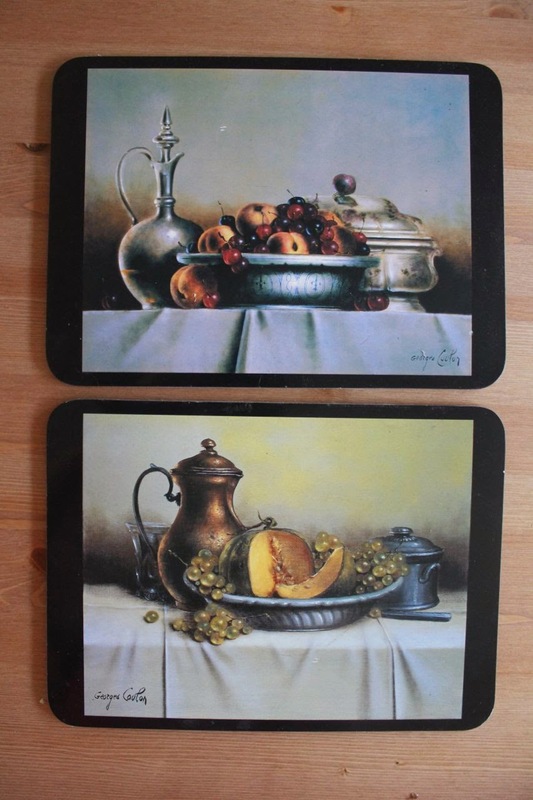 Cool on wire tray. Cover with tea towel while cooling to soften crust. *NOTE: The recipe called for 400ml of yoghurt. I used 250ml yoghurt and then soured 150ml milk with the apple cider vinegar. You could use 400ml of yoghurt or sour cream or buttermilk or soy milk soured with apple cider vinegar. Or just use any combination of these depending what you have on hand - as I did. Preheat oven to 180 C. Soak cashews for about 20 minutes in salted hot water while you prepare other ingredients. Drain when ready to use. Blend everything in processor except beans and cheese. 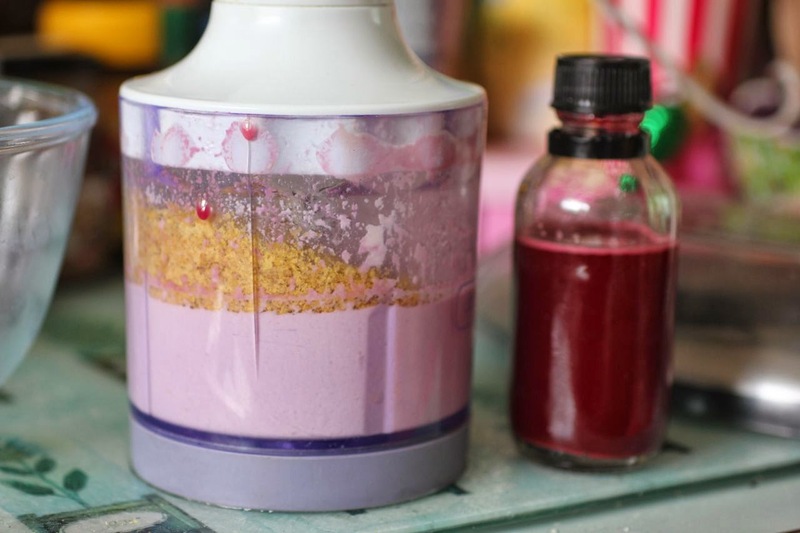 You may need to scrape down a few times until blended. Blend in beans and then stir in cheese. Spoon into a small baking dish and bake 15 minutes to warm through. Serve warm with bread or crackers. 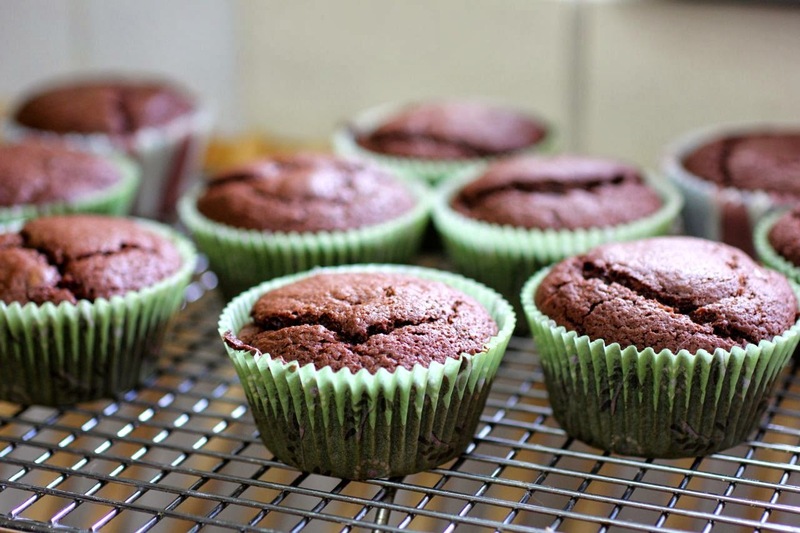 Preheat oven to 180 C and put cupcake papers in a 12 whole cupcake or muffin tin. Melt butter, chocolate and sugar. Stir in eggs one at a time to make it glossy and thick. Stir in flour, baking powder and salt until combined. Gently mix in walnuts or choc chips if desired. Spoon mixture into cupcakes papers only about 2/3 full or less (I think mine was less). Bake for 20 to 25 minutes until a skewer inserted comes out cleanly. Cool on a wire rack and ice with buttercream frosting or ganache.